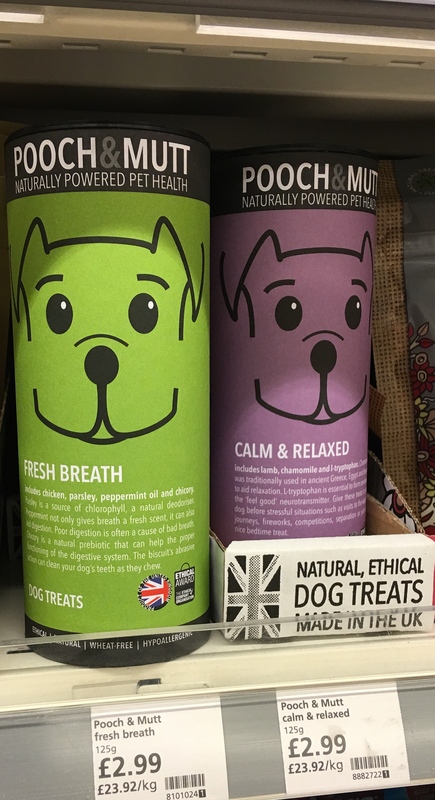 Buying British made pet products (including British made pet food), especially from small local companies, supports British jobs, saves on transport (so it’s much better for the environment), and offers quality and flexibility. Plus the money circulates more quickly, supporting UK manufacturing and employment. Additionally the use of sweatshops and child labour in the UK is very unlikely. Pet Mate, established in 1986, is an importer of products for pets and ponds. 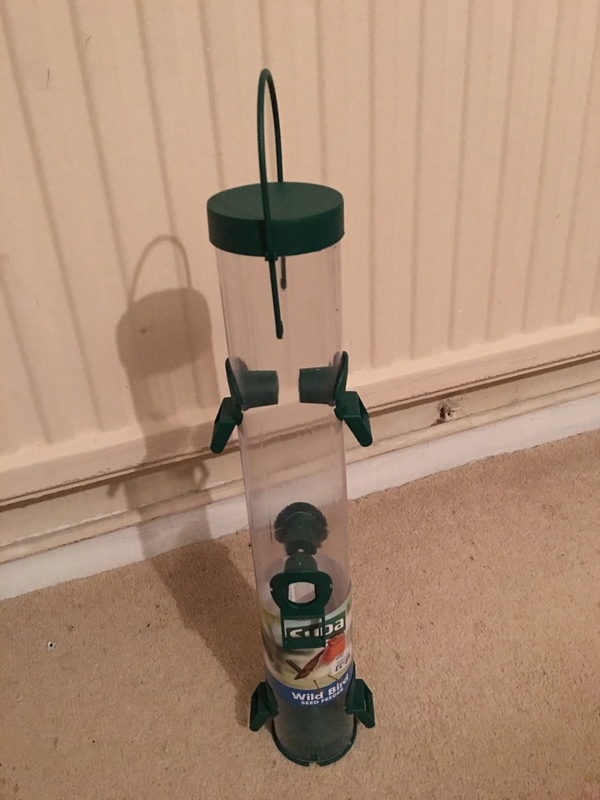 Their website mentions “…careful UK controlled manufacture” and at least some of their products, such as the automatic cat feeder pictured below, used to be UK made. However, unfortunately they no longer manufacture in the UK. 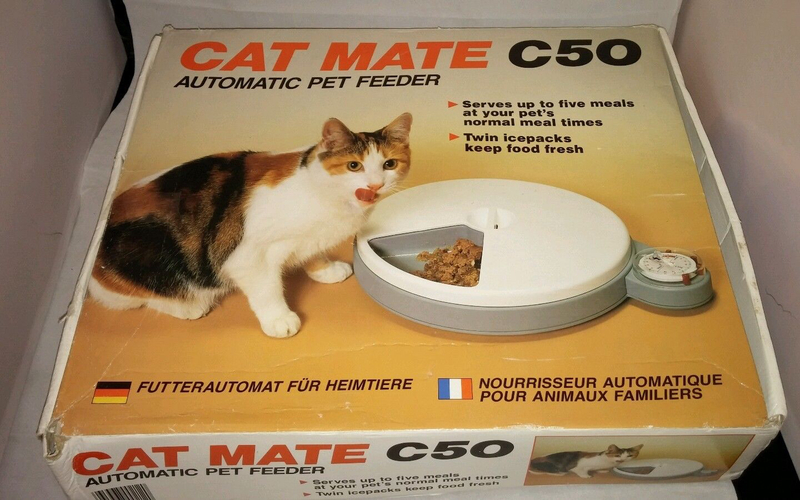 A “vintage” Pet Mate Cat Mate C50 Automatic Cat Feeder. Manufactured in the UK. Front of packaging view. 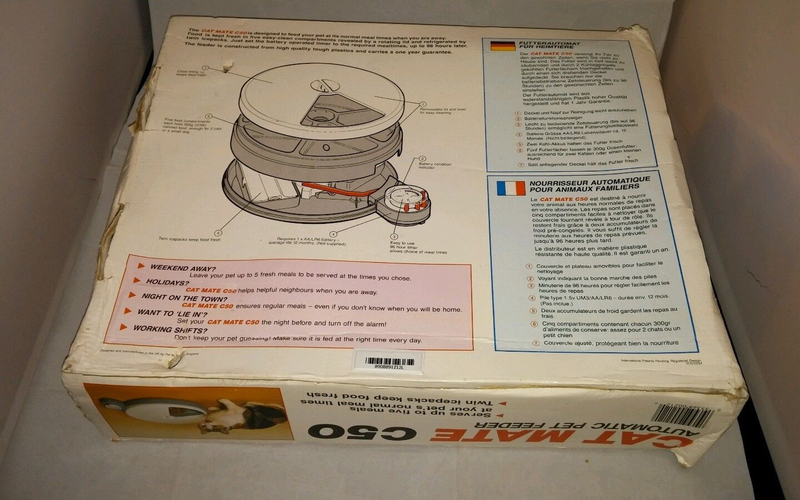 A “vintage” Pet Mate Cat Mate C50 Automatic Cat Feeder. Rear of packaging view. The words “designed and manufactured in the UK” are visible bottom left. With this automatic pet feeder, remember to rotate the lid anticlockwise first until bowl ‘O’ is revealed to ‘set‘ the lid. This video explains how to use the cat feeder. Caldex Classic pet drinking bottles. Made in England. Photograph by author, in Selections Pet and Garden Store in Leighton Buzzard. Caldex Classic pet drinking bottles. Made in England. Close-up label view. Photograph by author, in Selections Pet and Garden Store, Leighton Buzzard. Outside packaging of a Maypole Anti-fungal Heavy Duty Bird Table Hand Built in the UK by The Hutch Company. It says Made in the UK on it. Photograph by author 9 November 2018. 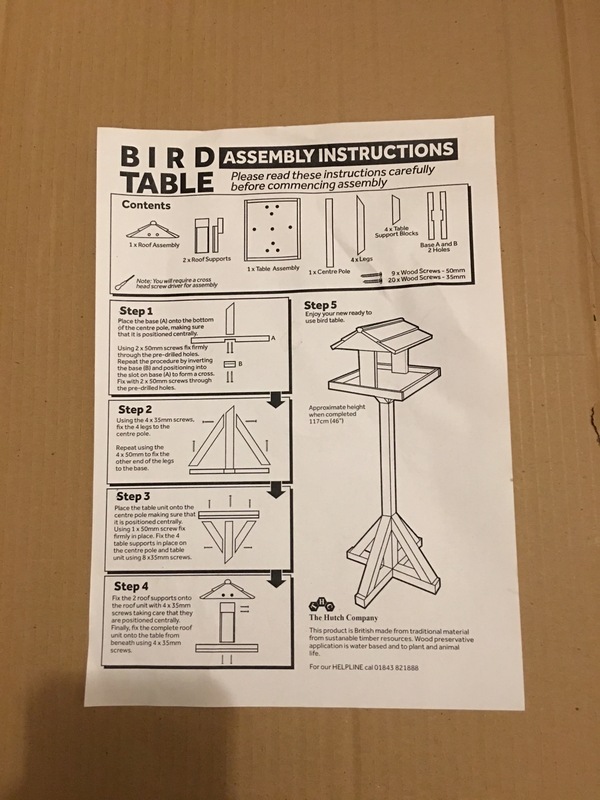 Build instructions for a Maypole Anti-fungal Heavy Duty Bird Table Hand Built in the UK by The Hutch Company. It says the product is British made on them. Photograph by author 9 November 2018. Lacashire Textiles Standard Green Pet Bed/Pillow for Cat or Dog. Also showing a terracotta coloured pet pillow. Made in Britain. 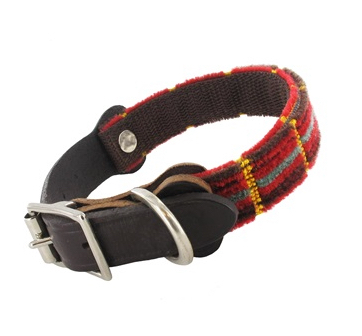 Routemaster Moquette Dog Collar. Made in the UK. 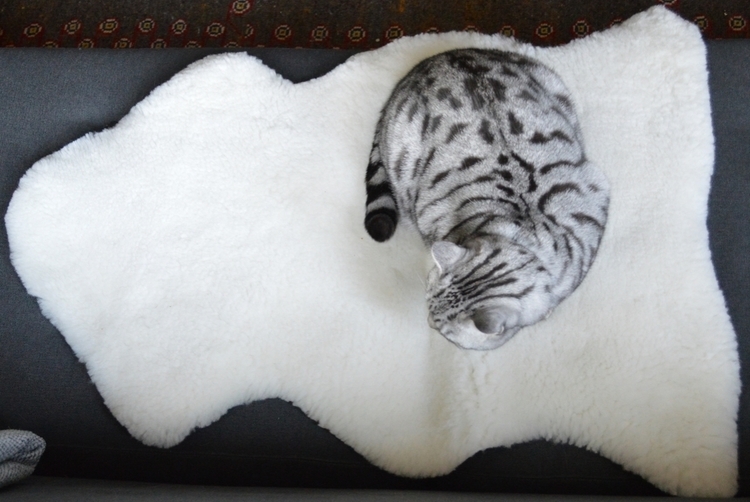 Cheshire & Wain Snow White Sheepskin Rug for cats. Made in England. 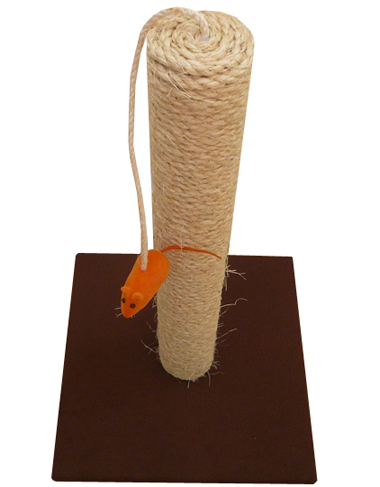 ScratchyCats VALUE Small Cat & Kitten Scratching Post. Made in England. 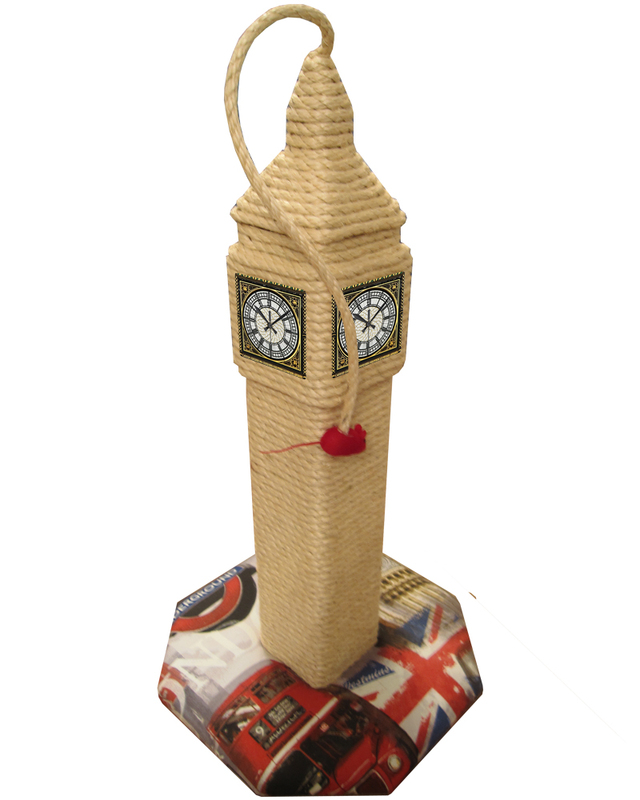 ScratchyCats Big Ben Cat Scratching Post. Made in England. 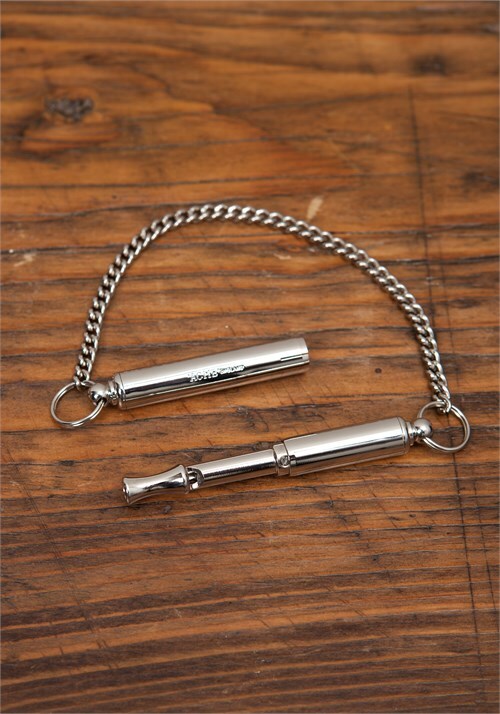 Acme make the finest whistles in the world, including various dog training whistles, shepherd whistles and silent whistles. All made in England. Available via the Acme Whistle website and elsewhere. 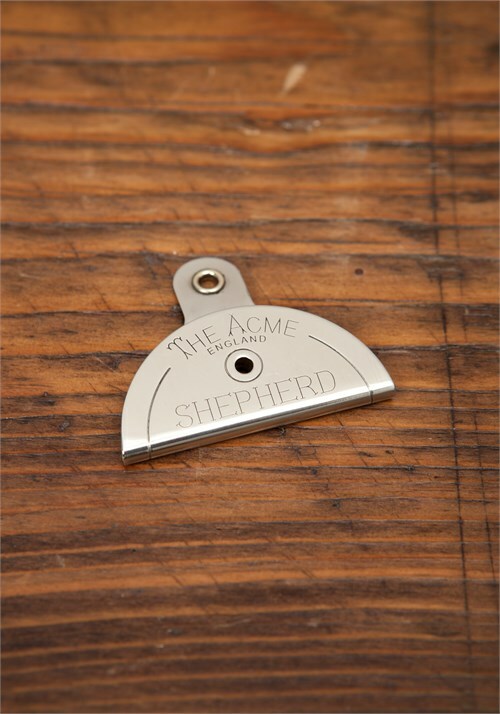 Acme Shepherd 575 Mouth Whistle. Made in England. Acme Silent 535 Dog Whistle. Made in England. Pet N Home are one of the UK’s leading manufacturers of Pet Bedding, including vet bed, dog cushions, pads and blankets. They have a factory in Somerset and many of the products they sell are British made. 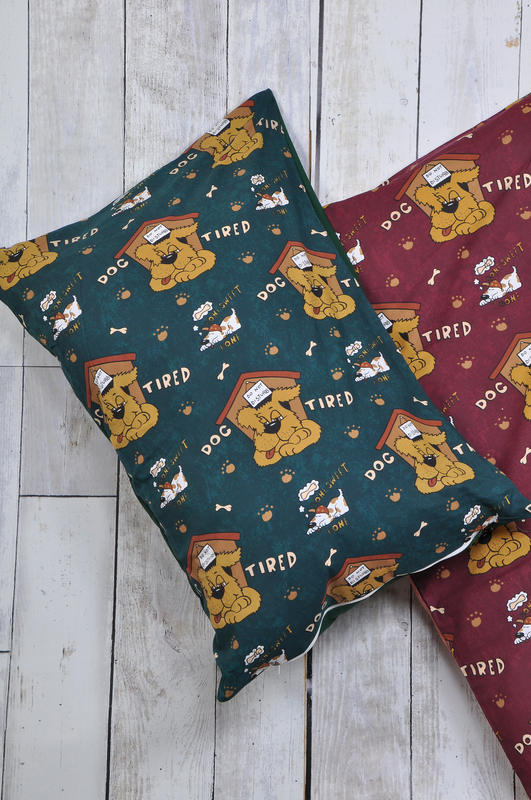 They also sell household cushions and a large selection of pet and home accessories. It says on their website which products are British made. 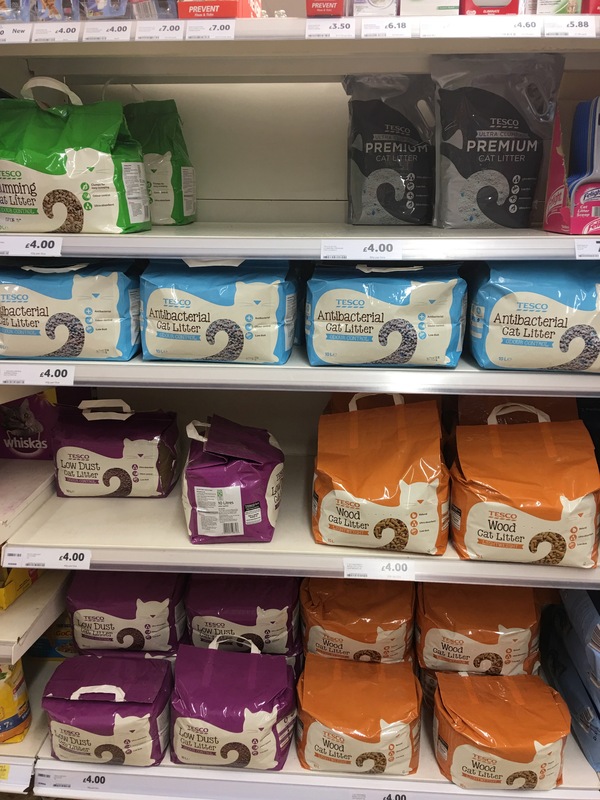 PnH Veterinary Bedding – By The Roll – Brown. PnH Veterinary Bedding is British made. Pet N Home Red Tartan Sherpa Fleece Cat Cushion. British made. 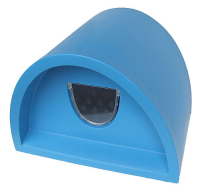 Pet N Home Plastic Cat House / Igloo With Cat Flap – Blue. Waterproof. Indoor and outdoor use. Manufactured In England & Available 5 Colours. 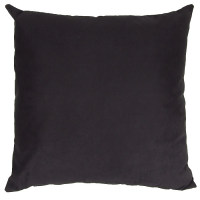 Pet N Home Black Faux Suede Cushion (Large 65cm x 65cm) – COMPLETE WITH HOLLOW FIBRE FILLED INNER. Removable inner. British made. 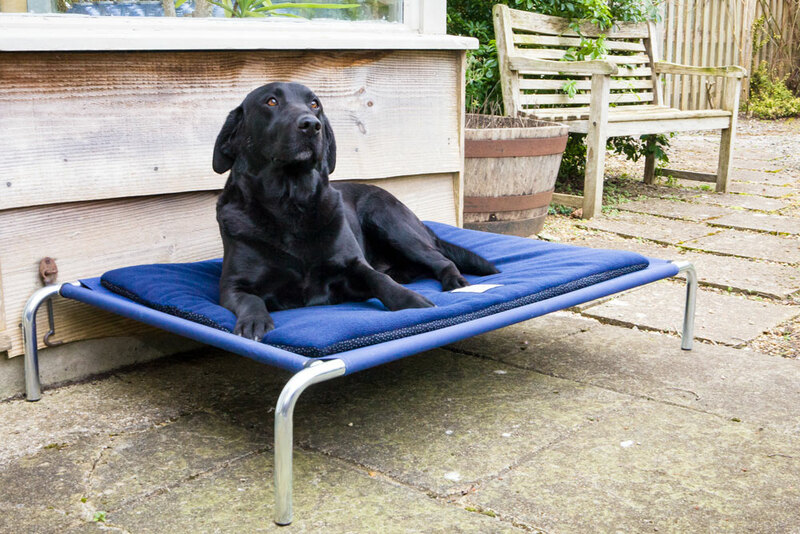 Reefer make their recycled sailcloth pet beds and other great stuff in England. Ditsy Pet have dog collars, leads and bandanas; all made in the UK. Journeyman Leather make saddlery and dog collars and leads in the UK. Cotswold Aquarius make fold away portable dog bowls, dog collars, and a waterproof dog bed. Cotswold Aquarius state on their website that they “are extremely proud of the fact that every item we produce has been designed and hand crafted here in Great Britain”. The Vetbed by Petlife is made in England – http://petlifeonline.co.uk. 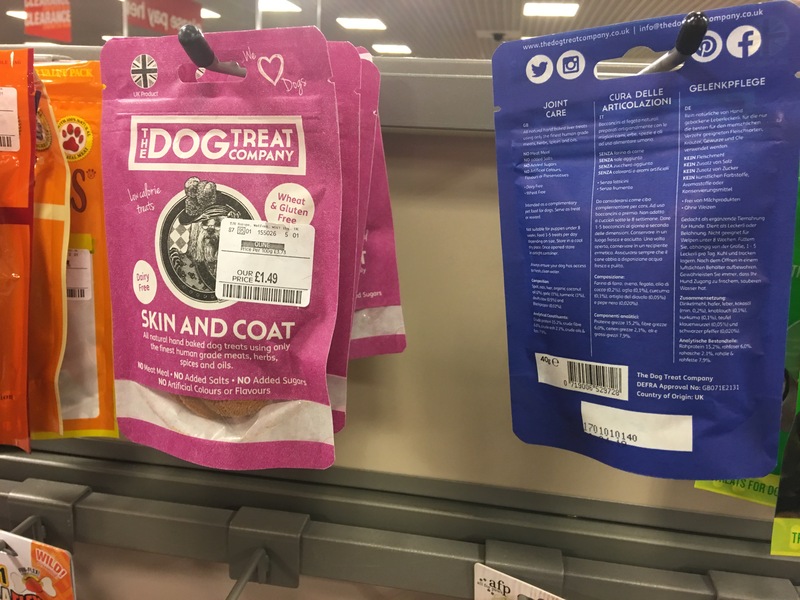 Note that not all the products Petlife sell are made in the UK. KJK Ropeworks (KJK Rope Leads) manufacture solely in the UK – rope dog leads, braid dog leads – their rope leads are hand made in the U.K. 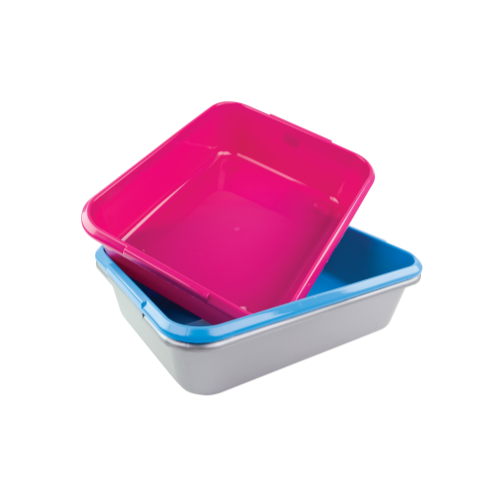 They are light, strong, durable and washable and come with steel or brass fittings. They also sell lanyards (useful for for whistles, mobile phones, knives, keys, fly fishing, etc.) and knot balls (rope dog toys). As well as dog products KJK Ropeworks also manufacture calving, lambing ropes and small halters. Outhwaites Ltd (Ropemakers) make their rope products in the UK in Hawes, Wensleydale, North Yorkshire. I am not sure if all their products are made in the UK so please check before buying, but they have a manufacturing facility in Hawes (where they also have a visitor centre). 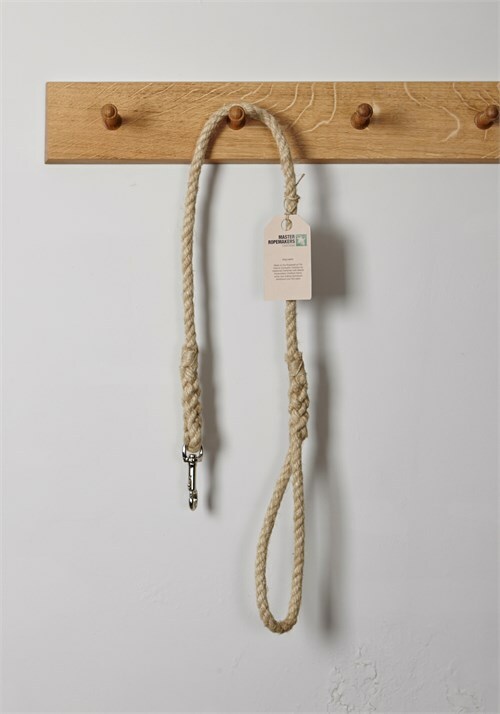 They make ropes for the equestrian, farming and gardening markets, bannister ropes, barrier ropes, braids, rope pet toys, rope pet collars and rope pet leads. I note that the the Outhwaite Pet Divsion has recently been sold to The Animate Company based in Ripponden. 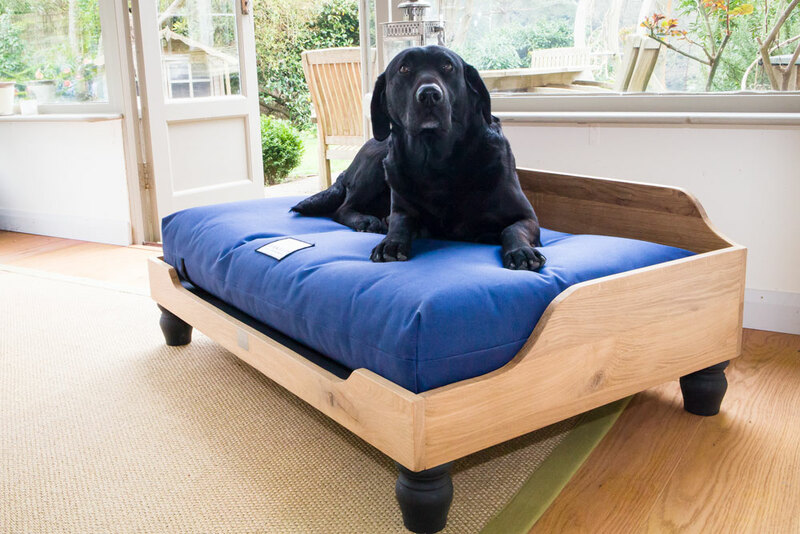 There is scant information about Animate on the web but they appear to make dog beds in the UK as their website (such as it is) mentions a factory showroom. Master Ropemakers Chatham sell animal halters, parrot perches, rope dog toys and dog leads. I get the impression from their website that these are made in the UK at Chatham Dockyard, but please check this before buying. Available via their website and also at Lissom and Muster. Master Ropemakers Chatham Hemp Rope Dog Lead, 10mm, Tarred Whipping. Made in Kent, England. Lissom and Muster sell a dog lead and a dog collar made in England by Cherchbi. Green Peak Gear make dog leads from retired climbing rope. Available via the Green Peak Gear Amazon shop. BBD leather dog leads are manufactured in England. I think that the other items they sell are imported. Big Hug do pet bean bag beds and fleece blankets which I think are made in the UK (do check before buying). Hug Rug make pet rugs and pet runners for your pet in England. The Dartmouth Canvas Factory make a canvas dog or cat water bowl. Holds water. Fits in your pocket or bag. Made in Devon, England. Dartmouth Canvas Factory Dog Water Bowl Size Small. Holds water. Fits in your pocket or bag. Creature Clothes – Hand-made in the UK – Their website states “We design everything in-house, test all of our products with our intrepid team of testers before sale, and manufacture all of our goods in the UK, primarily in our Suffok workshop.” – blankets, collars, leads, bandanas, emergency treats, beds, Union Flag goodies, wedding clothing for pets, wedding stationery for cats and dogs, and even some stuff for humans – http://www.creatureclothes.com. Cosipet (Alex Griffiths Cosipet Ltd.) manufacture all their products in the UK. 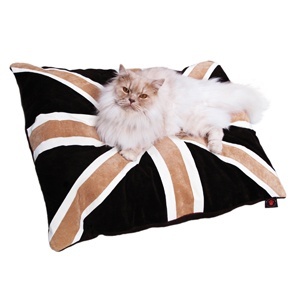 They say on their website “we still manufacture all our products in the UK” – available in good pet stores and online for example at Seapets and PetPlanet – they make a wide variety of dog coats, cat beds and dog beds, basket liners, igloos, bean bags, novelty beds, bandanas, cushions, crate waterproof cushions, Tough Pad waterproof cushions, Dri-Dog bags, and dog carrying bags – http://www.agcosipet.co.uk Update 3/1/16 – sadly Cosipet went into liquidation in September 2015. 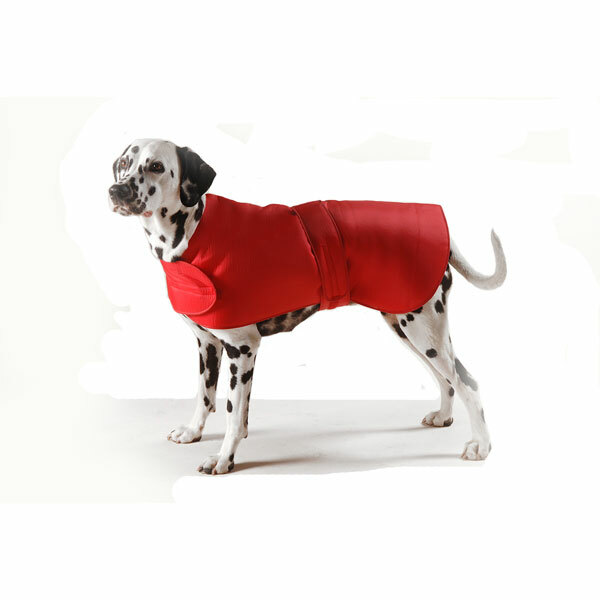 Cosipet All Weather Waterproof Coat. Made in England. 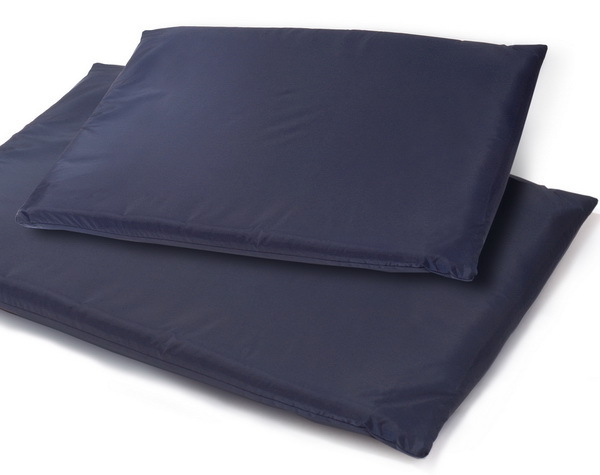 Cosipet Tough Pads in Navy. Made in England. 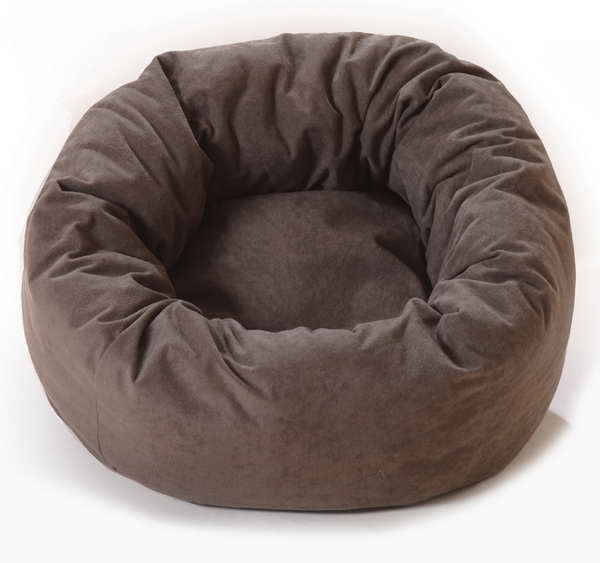 Cosipet Pet Chelsea Do-Nut Chocolate. Made in England. 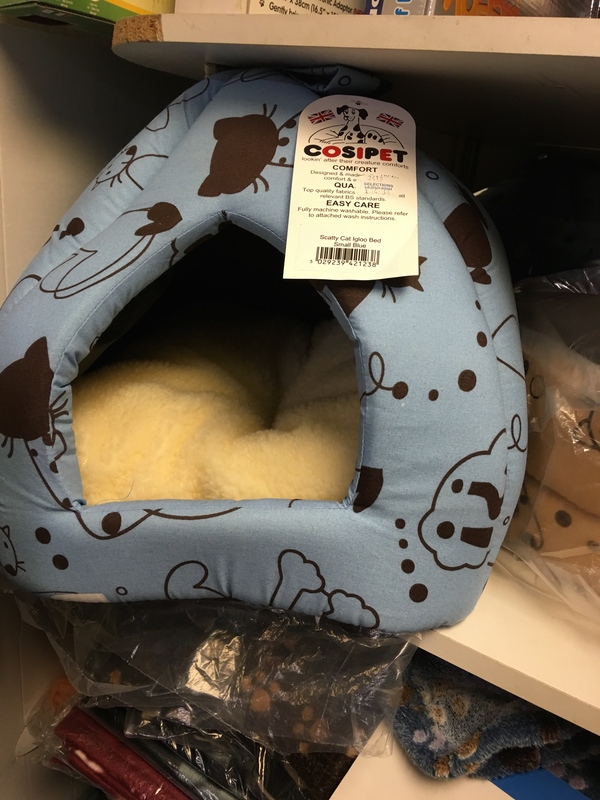 Cosipet Scatty Cat Igloo Bed. Small Blue. Made in the UK. Photograph by author 2/1/16, in Selections Pet and Garden Store, leighton Buzzard. I found made in England dog lead swivel clips on e-bay and also this UK made dog ramp again on e-bay. 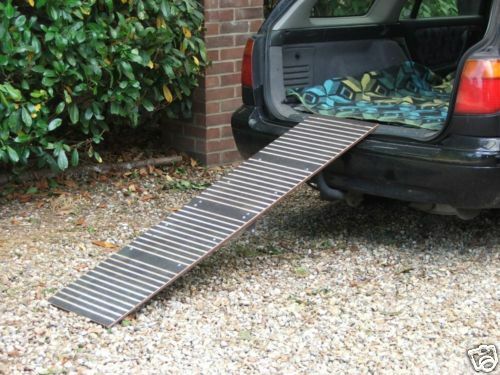 Dog Car Ramp Extra Long Heavy Duty Steel Made In The UK. On eBay. 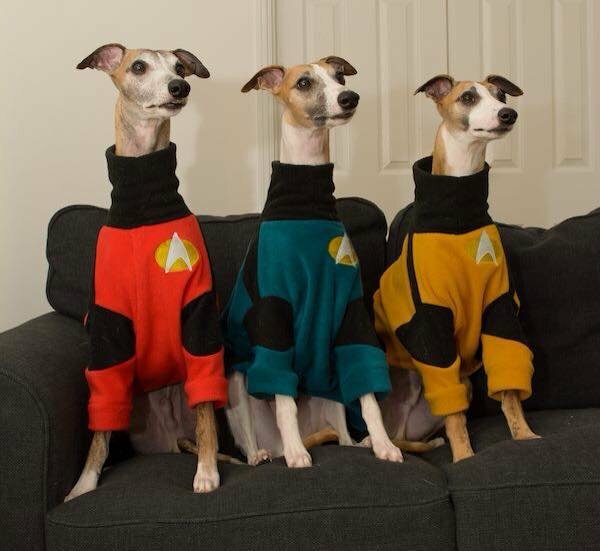 Star Trek Fleece Jumpers for dogs. Made in England by Forest Fleece. 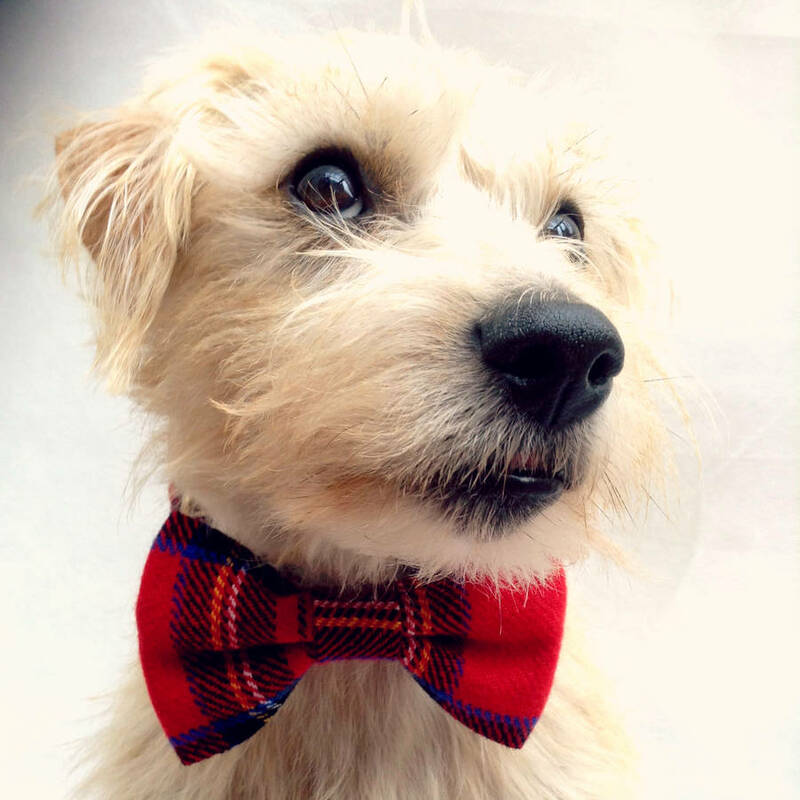 Christmas Tartan Pet Bow Tie by PUP TART HANDMADE. Made in Britain. 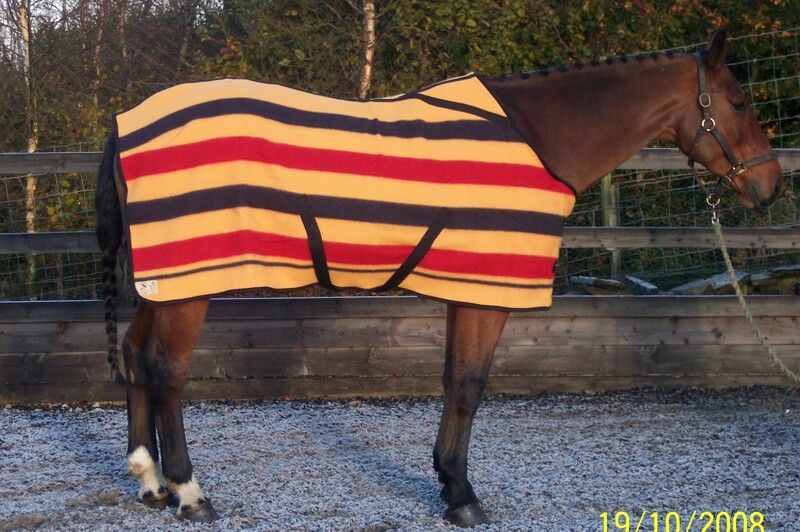 Lavenham Jackets make horse blankets and horse rugs in England. 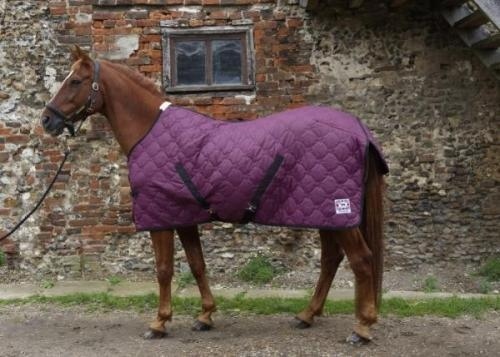 Lavenham Jackets Suffolk Sleeper horse blanket / rug. Made in England. Emma Bridgewater make pet bowls in their own factory in Stoke-on-Trent, England. 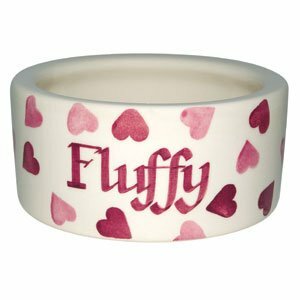 Emma Bridgewater Personalised Pink Hearts Small Pet Bowl. Made in England. Royal Warrant holders, Armitage Pet Care are the largest independent manufacturer and distributer of branded pet accessories and treats in the UK. As well as being distributers, they have a manufacturing facility in Nottingham, England. Wholesale, but easily available online, in supermarkets, pet shops, garden centres and so on. 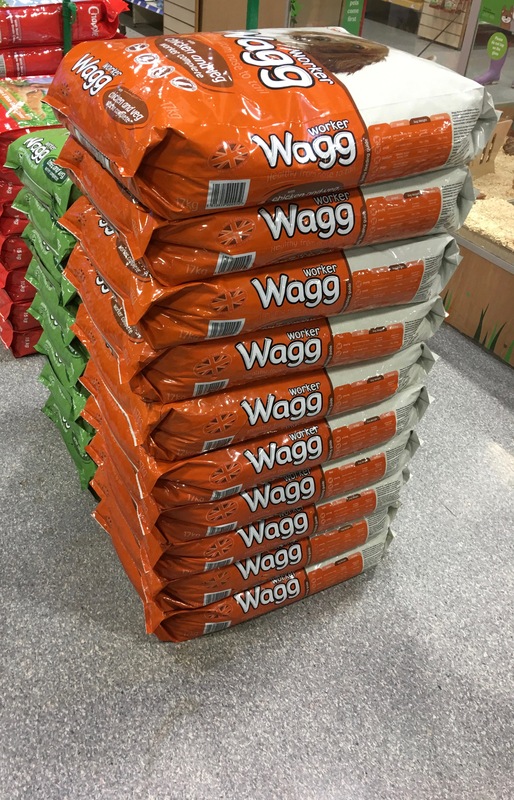 Among the products they make in Britain are: Wafcol dog food, Good Boy dog choc and treats, Clean Green Dog Loo, dog bowls, cat treats, cat bowls, cat litter trays, cat litter scoops, Rotastak hamster cages, pink/space/generic housing units for small animals, Rotastak small animal treats, caged bird sandpaper, perch covers and treats. Please note that by no means are all their products made in the UK so you will need to check before buying. Armitage Pet Care cat litter scoop. Made in England. 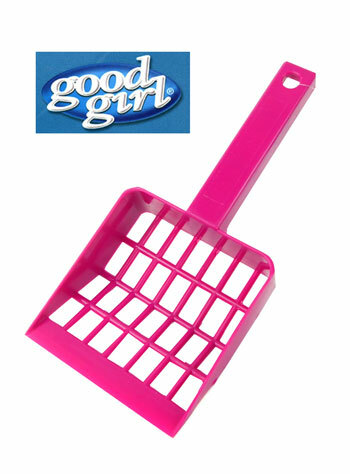 Armitage Good Girl Large Cat Litter Tray. Made in the UK. Available for example at WaitrosePet. Armitage Good Boy Choc Drops for dogs. Made using a specially formulated chocolate substitute that does not contain cocoa and is therefore completely safe for dogs to eat. 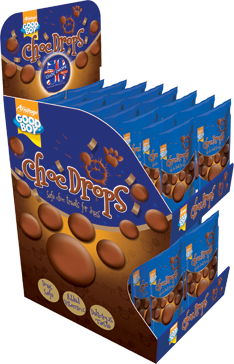 Armitage have been producing dog-safe choc drops in the UK for over 50 years . 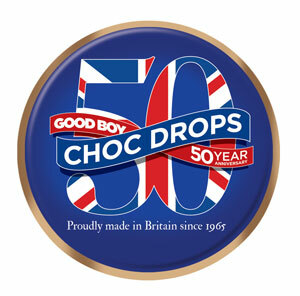 Armitage have been producing dog-safe choc drops in the UK for over 50 years . 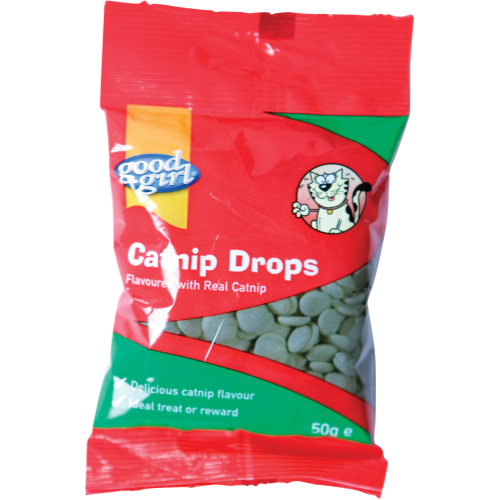 Armitage Good Girl Catnip Drops Cat Treats 50g. Made in the UK. Available for example at WaitrosePet. 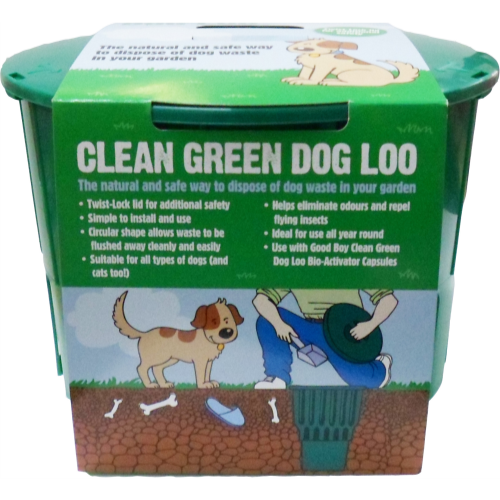 Armitage Good Boy Clean Green Dog Loo. A natural and sage way to dispose of dog waste in your garden. Made in the UK. Available for example at WaitrosePet. 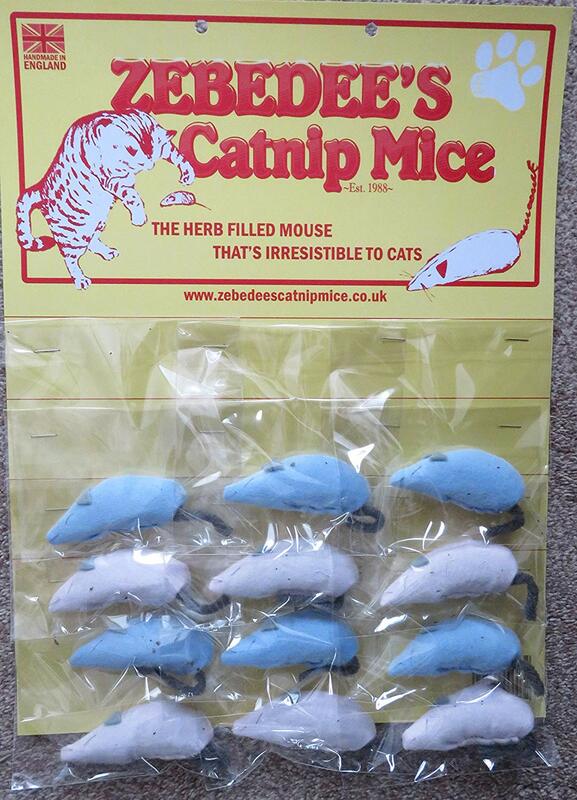 Zebedee’s Catnip Mice 12 mice display card. Top left the card says “Handmade in England”. 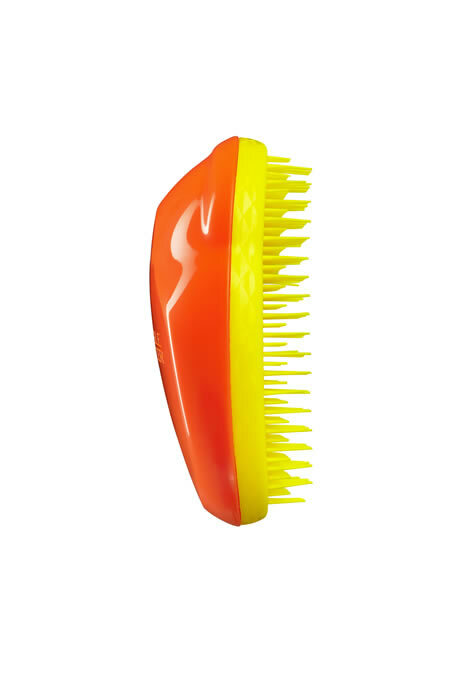 Tangle Teezer The Original Mandarin Sweetie hairbrush. Made in the UK. 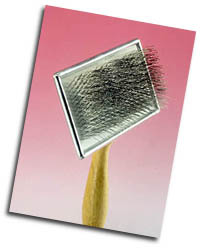 Lawrence Petcare Tender Care “For Cats” cat grooming brush. Made in England. 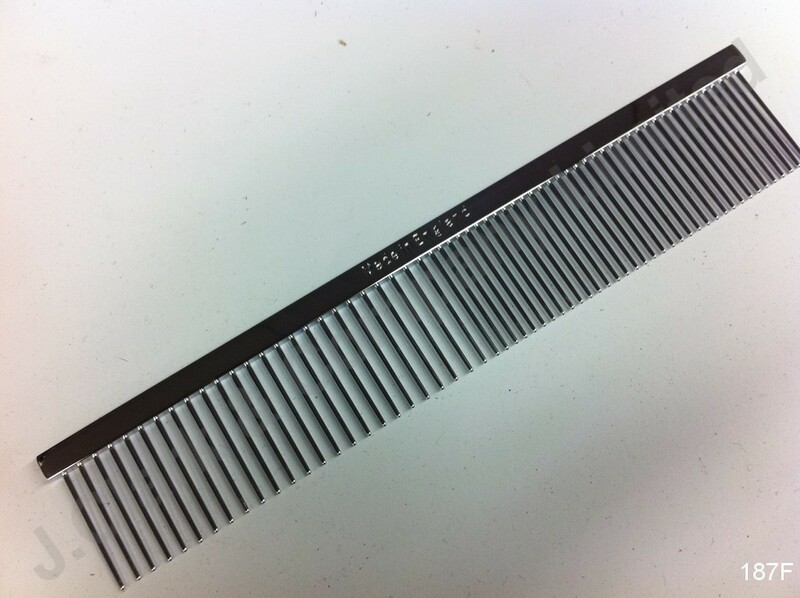 J.Clark & Company 187F comb. Made in England. 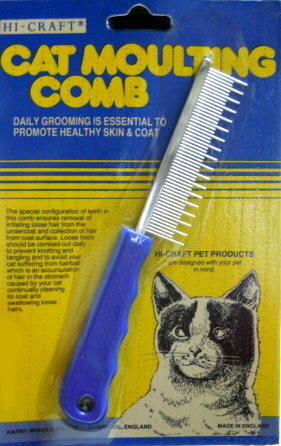 Hi-Craft pet combs for cats and dogs are made in England. No idea who makes these but they were still for sale in pet shops and online in April 2019. 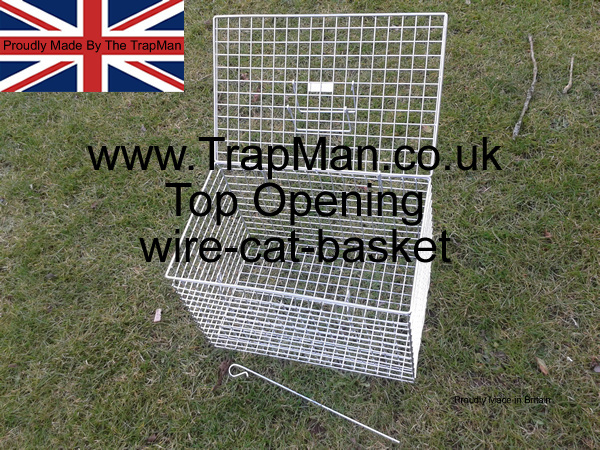 The Trap Man wire cat basket / carrier. Made in the UK. 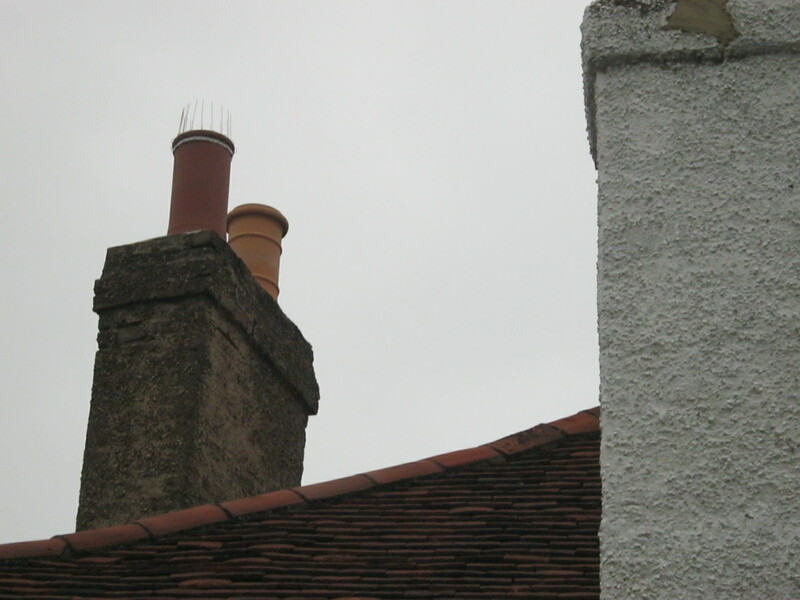 Jones and Son Defender chimney spikes. Manufactured in the UK. Photograph by author. 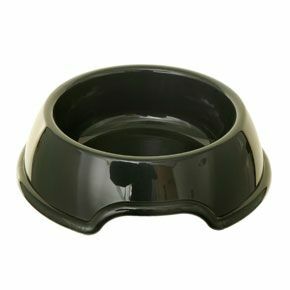 Whitefurze 15cm round pet bowl. Made in England. 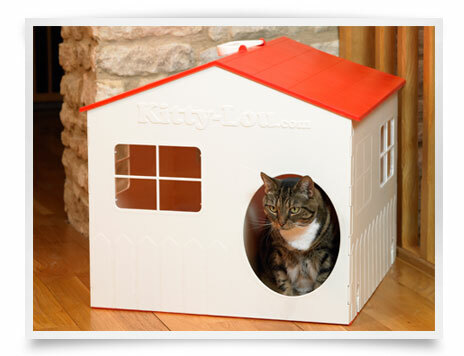 The Kitty Lou Cat Litter House. Made in the UK. 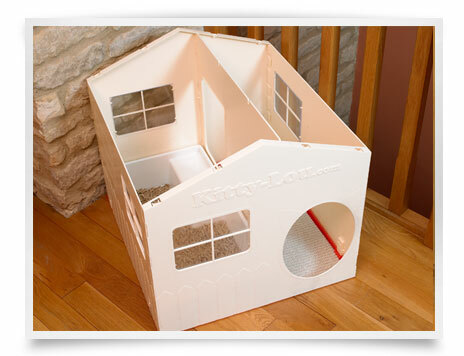 The Kitty Lou Cat Litter House. Made in the UK. View with lid off. 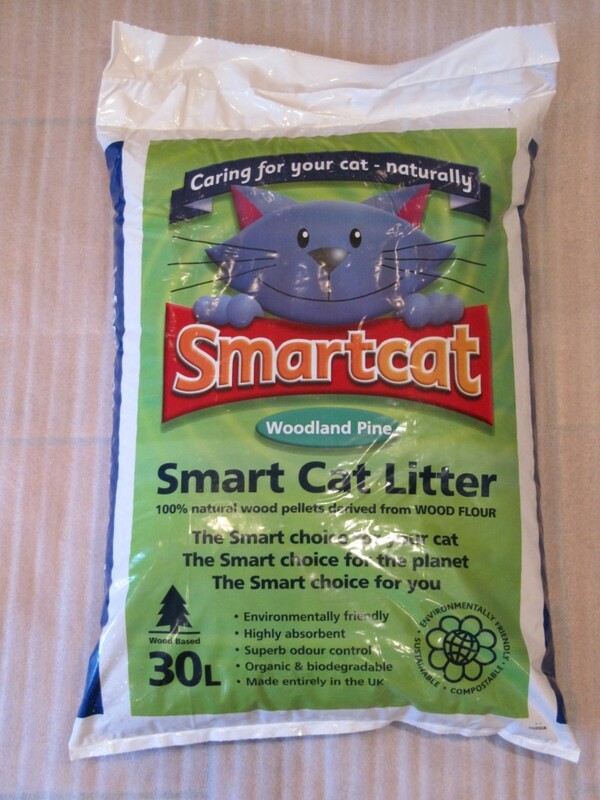 Smartcat cat litter. Wood based. Made entirely in the UK. Tesco wood cat litter, Tesco antibacterial cat litter, Tesco clumping cat litter and Tesco premium cat litter are all produced in the UK. Tesco low dust cat litter though is foreign made. Photographed by author in Tesco Flitwick 22 May 2017. Tesco antibacterial cat litter. 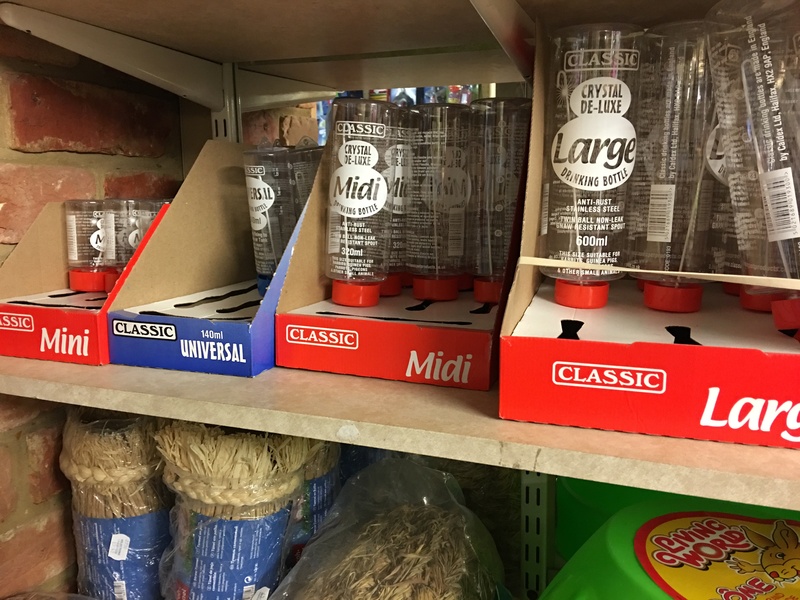 Produced and packed in the UK. Photograph by author 23 November 2017. 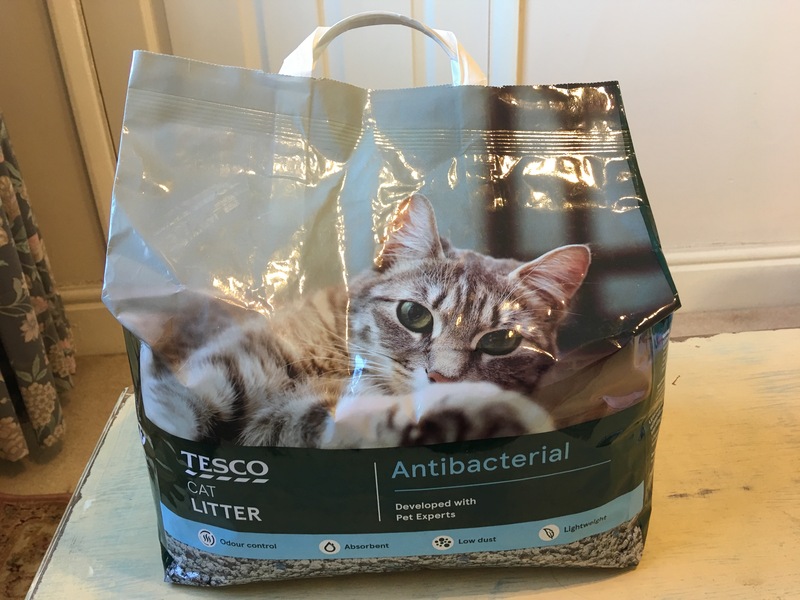 Tesco antibacterial cat litter. Produced and packed in the UK. Photograph by author 23 November 2017. Rear of packaging label view. 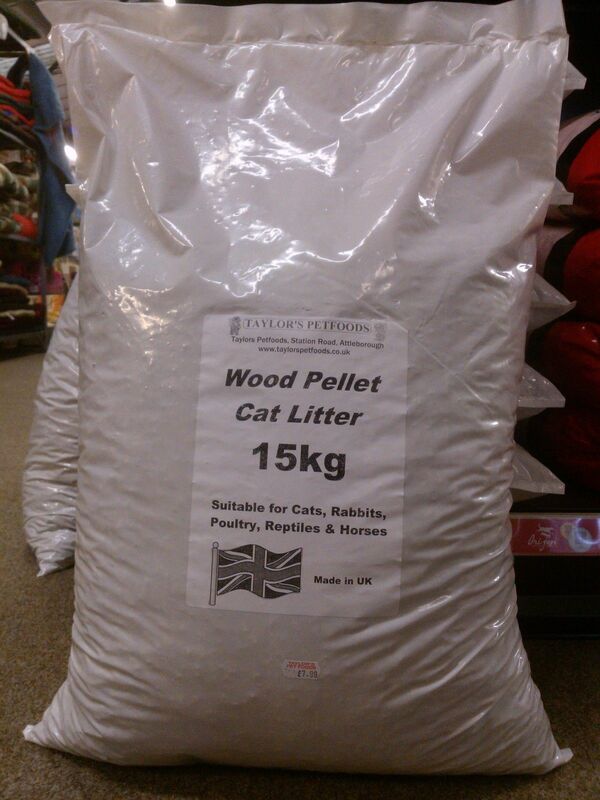 15kg Taylors Wood Based Pellet Cat Litter. Made in the UK. 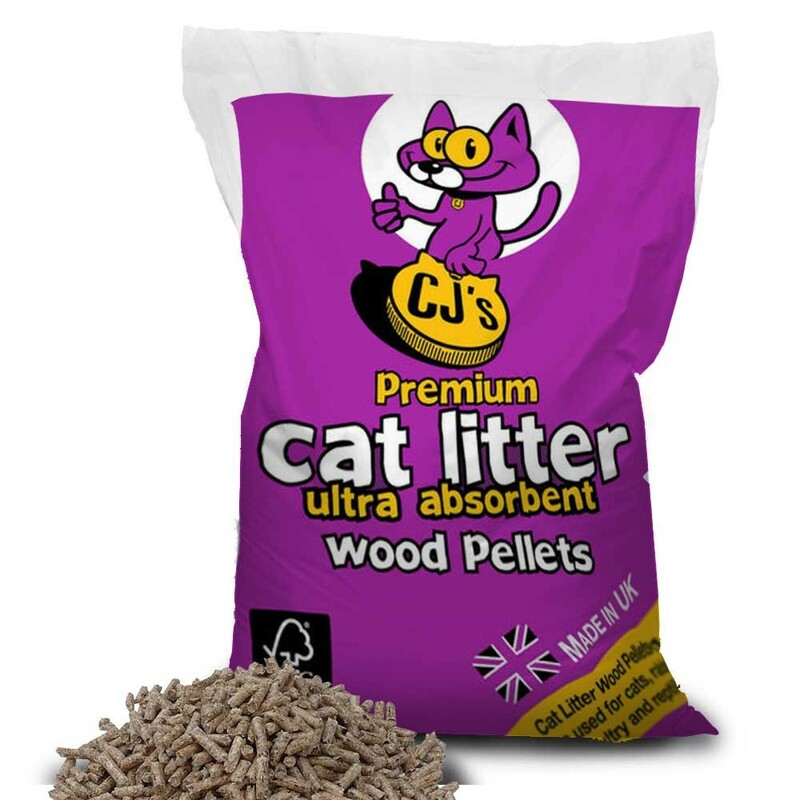 CJs Premium Cat Litter. Wood Based Pellets. Made in UK. Catsan cat litter is made by Mars Petcare. Available in supermarkets. Clay or wood based. No information about country of origin is given on their website. Catsan is manufactured worldwide and I don’t know whether any Catsan production takes place in the UK. It may not even say where it is made on the packaging. Thomas Cat Litter is apparently the UK’s No.1 selling branded clay based cat litter and is widely available. Again it is made by Mars Petcare and manufactured worldwide. I am not sure if any Thomas Cat Litter is manufactured in the UK and country of origin is not even given on the packaging. 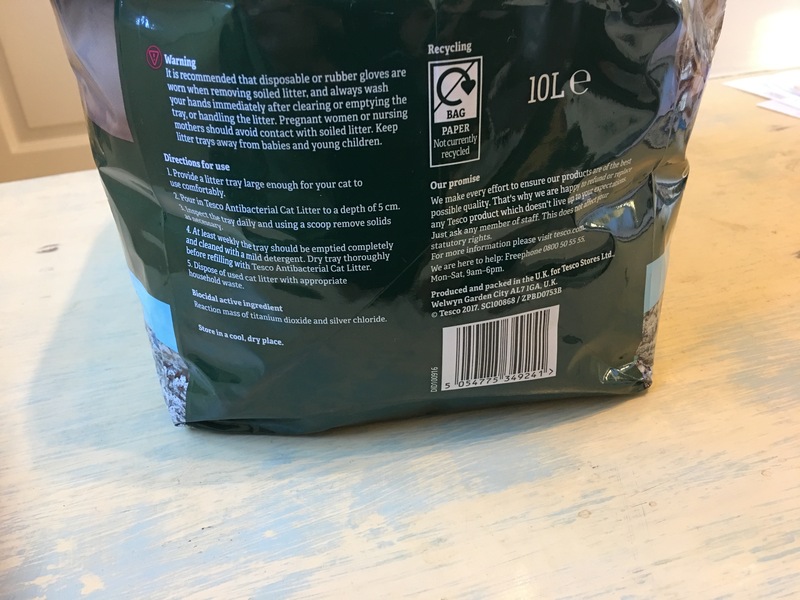 Sainsbury’s Wood Cat Litter 10L. 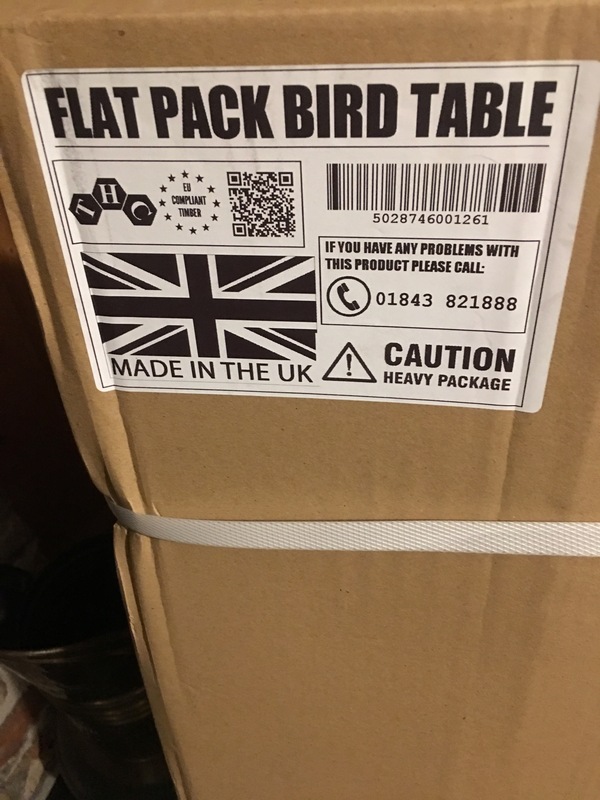 Produced and packed in the UK. Sainsbury’s chunks in jelly with chicken and duck tinned cat food. Produced in the UK. Photograph by author 25 March 2018. 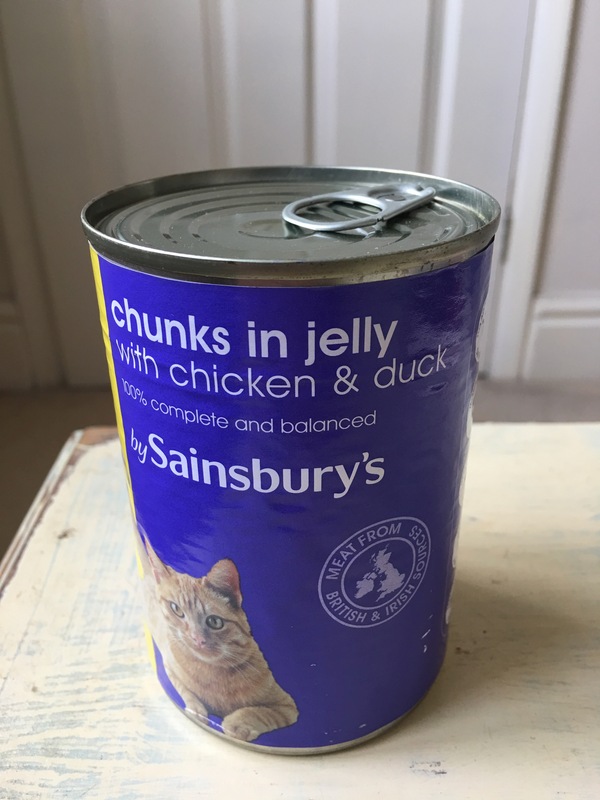 Sainsbury’s chunks in jelly with chicken and duck tinned cat food. Produced in the UK. Photograph by author 25 March 2018. Rear label view. I am unsure if Bob Martin (see below) cat litter is made in the UK, so please check the packaging (hopefully country of origin is labelled on the packaging). I am not sure if Greenwoods cat litter is made in the UK, but possibly not. Please check the packaging. Does anyone know of any more UK made cat litter? Robinson Animal Healthcare is a long established manufacturer of animal first aid woundcare and absorbents, including market leading brands such as Animalintex and Veterinary Gamgee. Almost all Robinson Healthcare products are produced at a large UK manufacturing facility in Worksop, Nottinghamshire so there is a good chance that the product you want will be made in the UK. They sell veterinary wound care, veterinary bandages, veterinary absorbents, equine first aid, anti-bacterial wash and kennel and cage liners. Available at veterinary surgeries, pet shops, online, and via the Robinson Healthcare website (in bulk). Robinson Healthcare also make a Horse and Rider First Aid Kit. 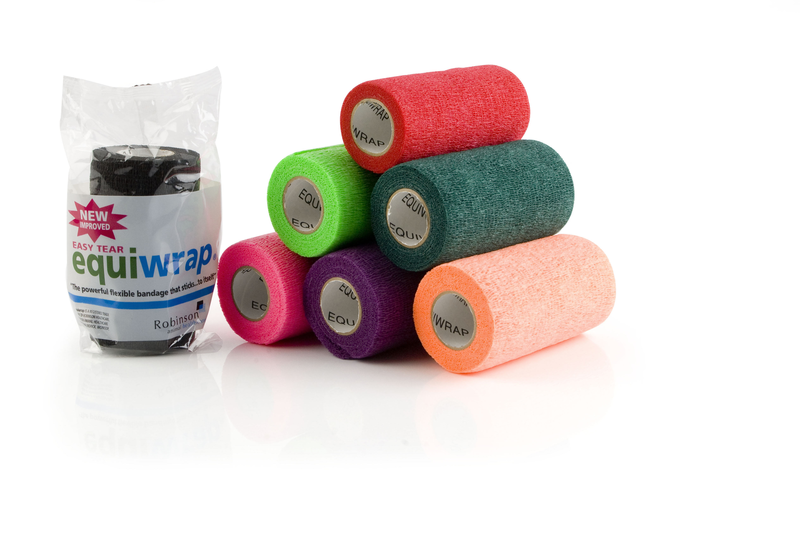 Robinson Animal Healthcare Equiwrap cohesive bandage. 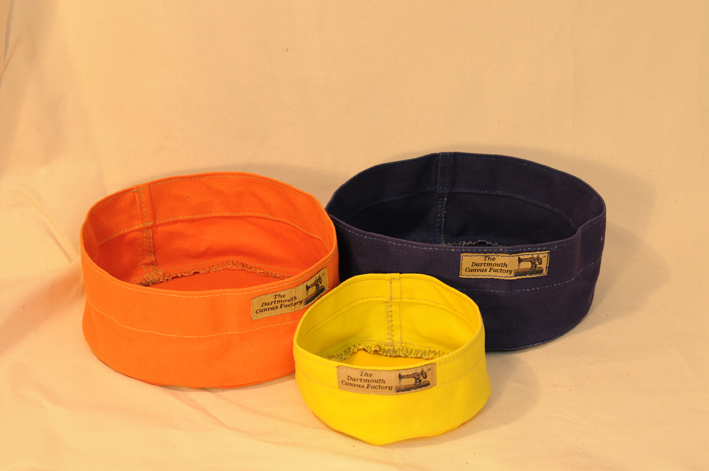 Fenella Smith – http://www.fenellasmith.com/store/dog-bowls – sell a range of made in England dog bowls. 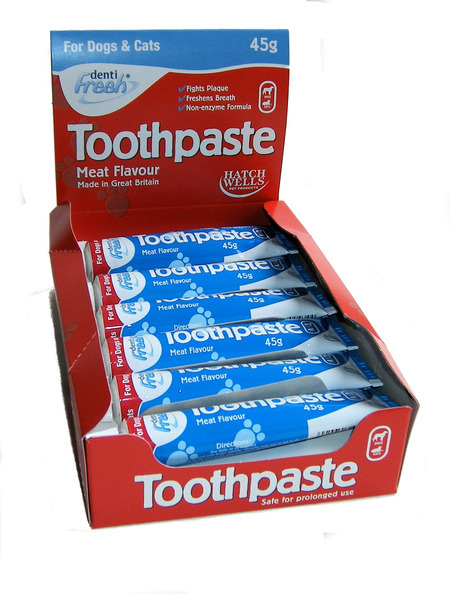 Hatchwells Meat Flavoured Toothpaste for Cats and Dogs 45g. Made in Great Britain. 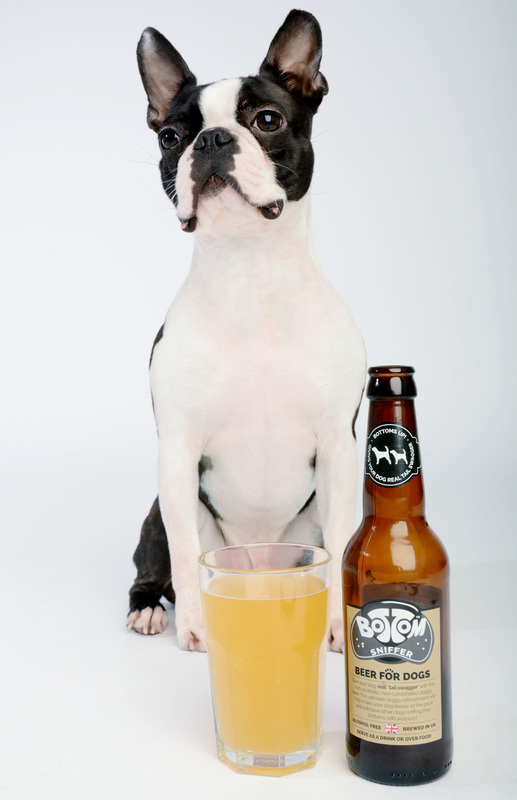 Woof and Brew BOTTOM SNIFFER BEER FOR DOGS ALCOHOL FREE BREWED IN UK. 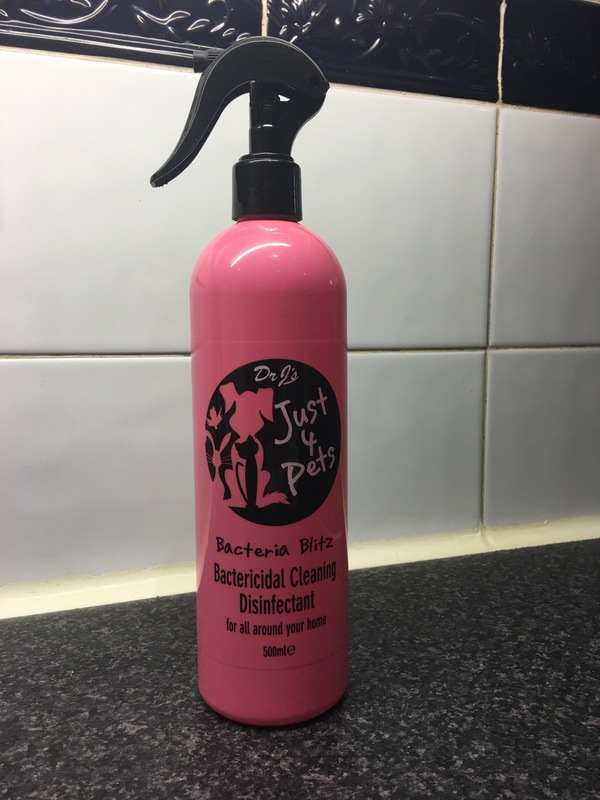 Dr J’s Just 4 Pets Bactericidal Cleaning Disinfectant. 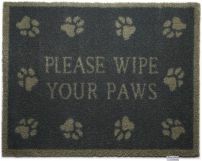 For cleaning up after your pets. Made in England. Photograph by author. 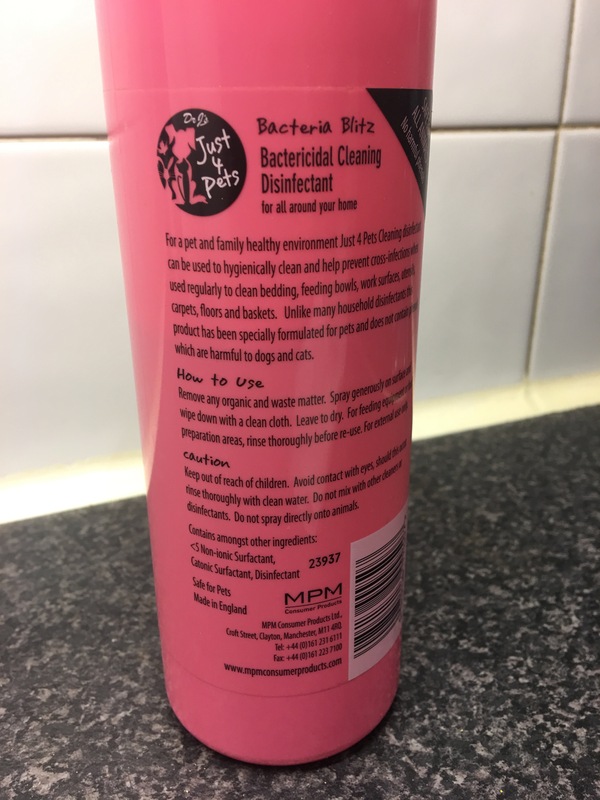 Dr J’s Just 4 Pets Bactericidal Cleaning Disinfectant. Made in England. Label view. Photograph by author. I read on the internet that cats cannot use human toothpaste and that you can use baking soda to brush your cats teeth, but that pet toothpaste is more enticing to them. 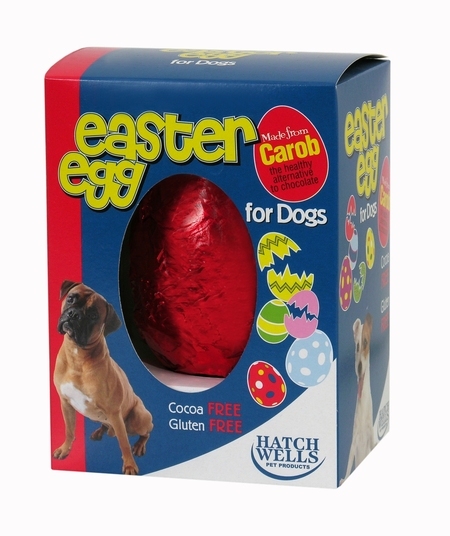 Hatchwells Easter Egg for dogs. Made in the UK, in Blackburn, England. Made from carob. Contains no cocoa and is gluten free. 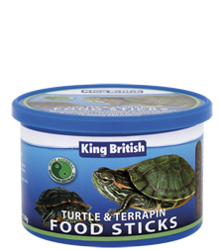 King British Turtle & Terrapin Food Sticks 110g. Made in the UK. 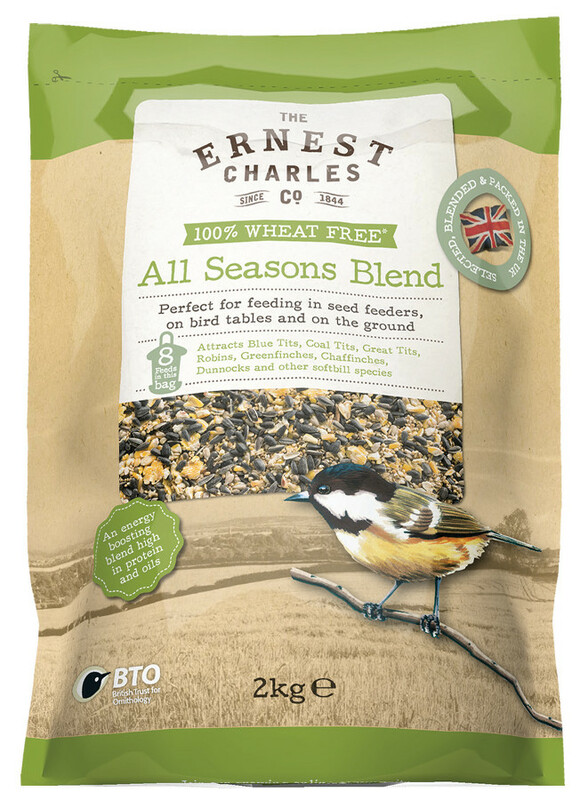 Ernest Charles All Seasons Blend Bird Feed – 2Kg. Selected, blended and packed in the UK. 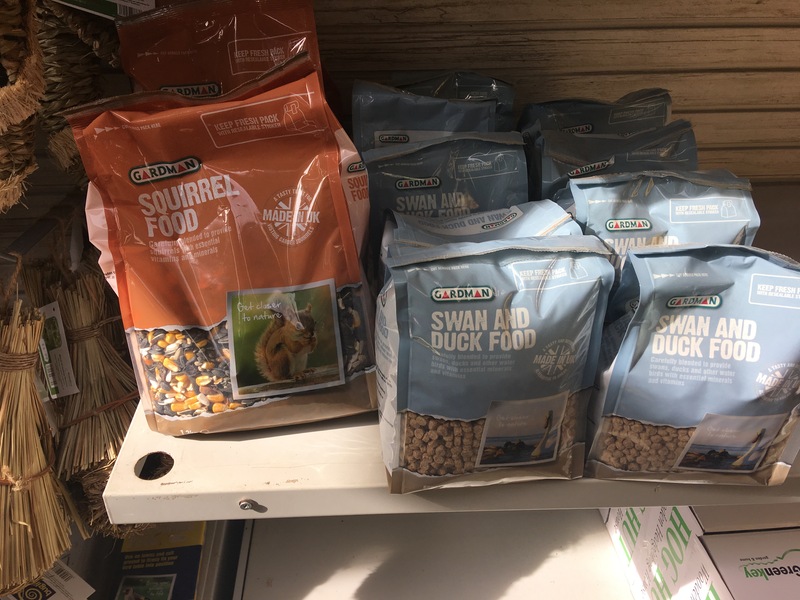 Gardman Sqirrel Food and Gardman Swan and Duck Food, on display in Flitvale Garden Centre in Flitwick. Made in UK. Photograph by author 26 March 2017. 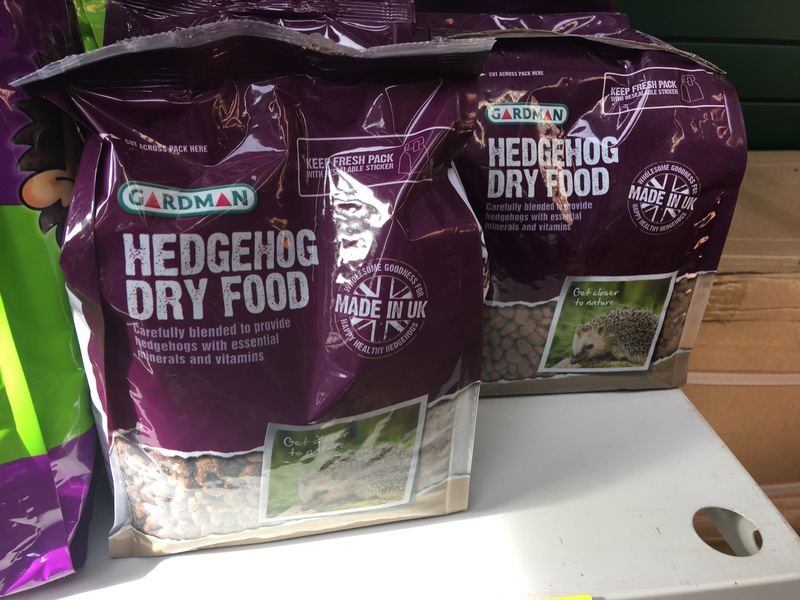 Gardman Hedgehog Dry Food, on display in Flitvale Garden Centre in Flitwick. Made in UK. Photograph by author 26 March 2017. 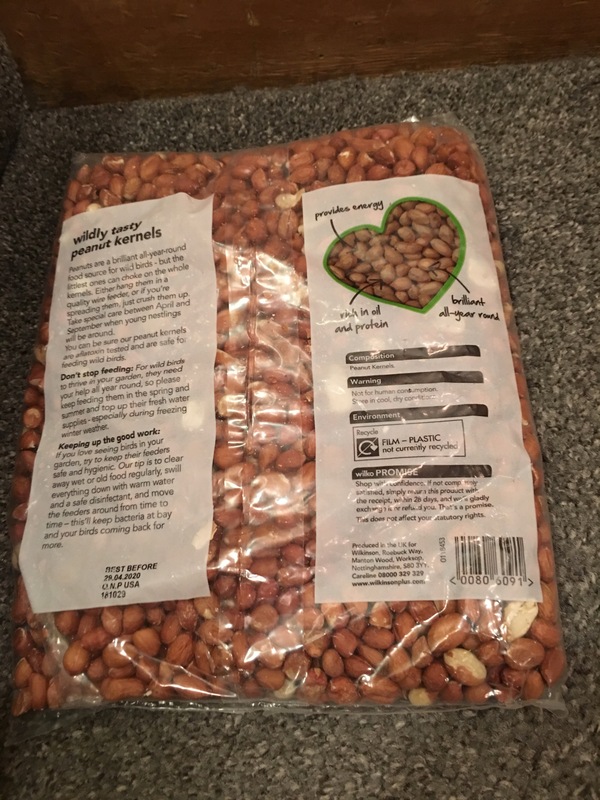 Wilko wildly tasty peanut kernels for garden birds. Produced in the UK for Wilkinson. Photograph by author 16 December 2018. 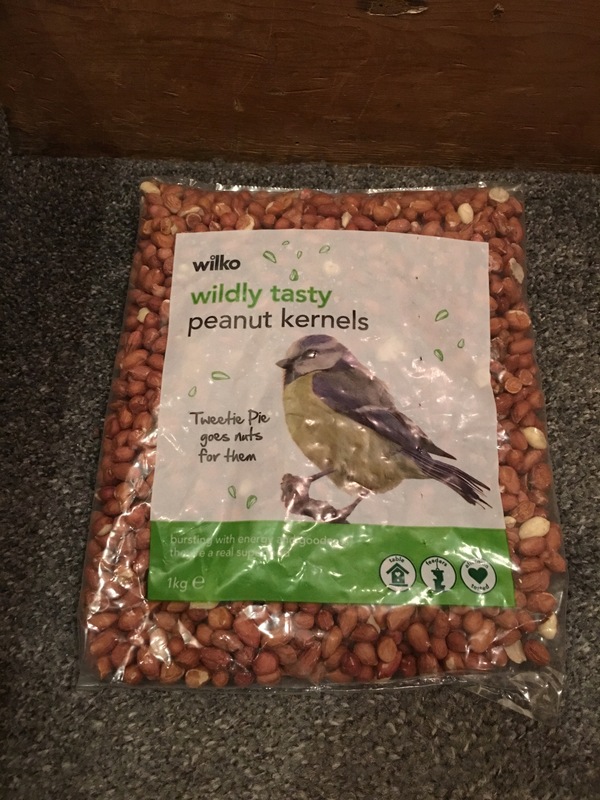 Wilko wildly tasty peanut kernels for garden birds. Produced in the UK for Wilkinson. Photograph by author 16 December 2018. Rear of packaging label view. 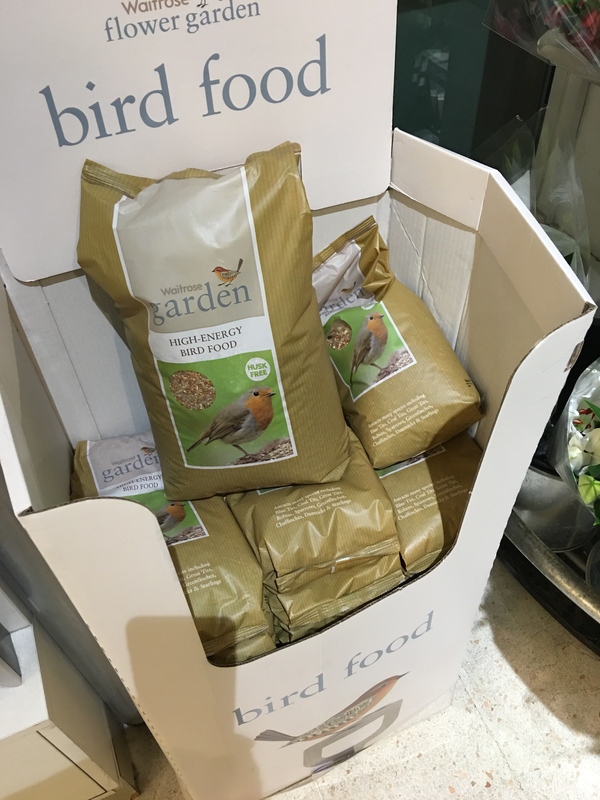 Waitrose Garden Bird Food. 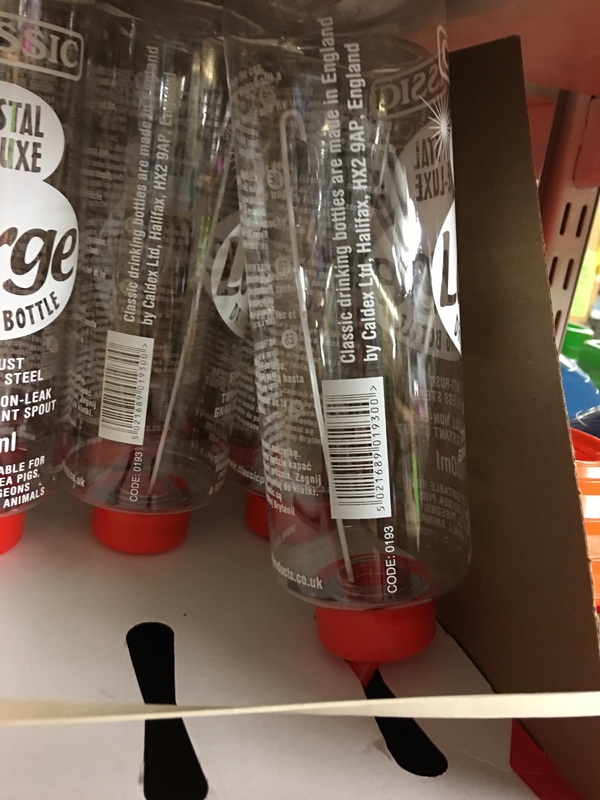 Produced in the UK or just packed in the UK – check the packaging to see which. 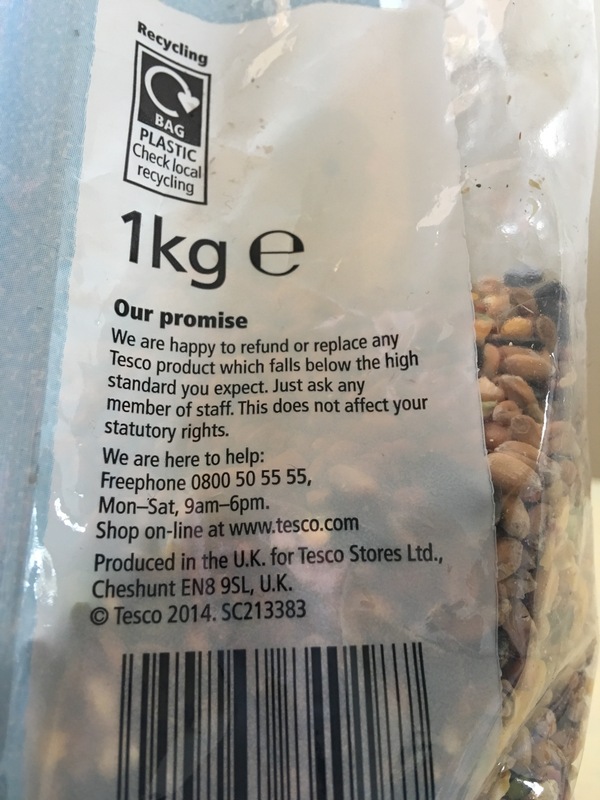 Tesco own brand wild bird seed. Produced in the UK. Front of packet view. Photograph by author. 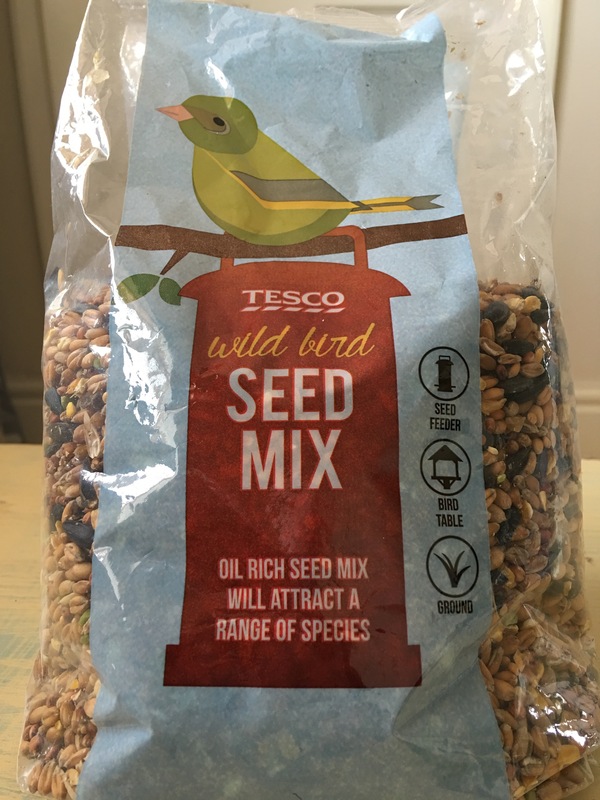 Tesco own brand wild bird seed. Produced in the UK. Rear of packet view. Photograph by author. 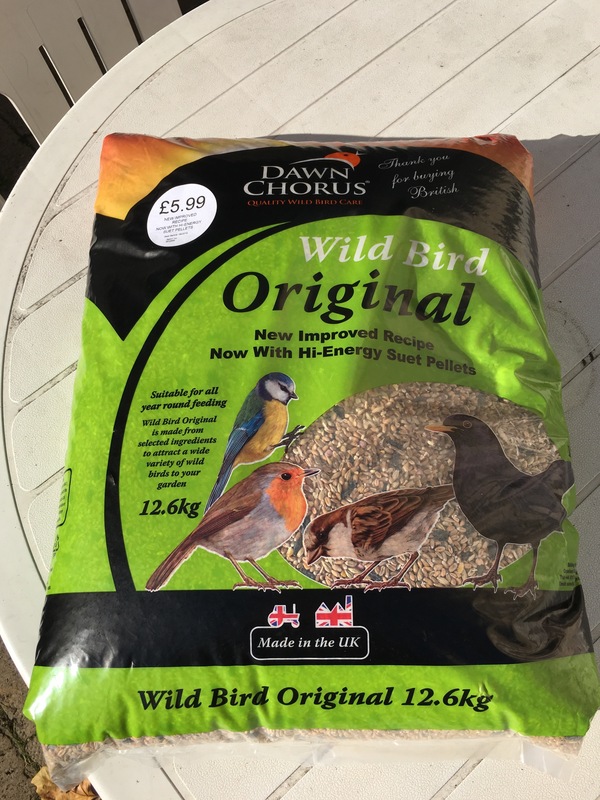 Dawn Chorus wild bird original seed, 12.6kg. Made in the UK for Bulldog Products Ltd of Southport. Photograph by author 28th October 2018. Dawn Chorus wild bird original seed, 12.6kg. Made in the UK for Bulldog Products Ltd of Southport. Rear of packaging label view. Photograph by author 28th October 2018. 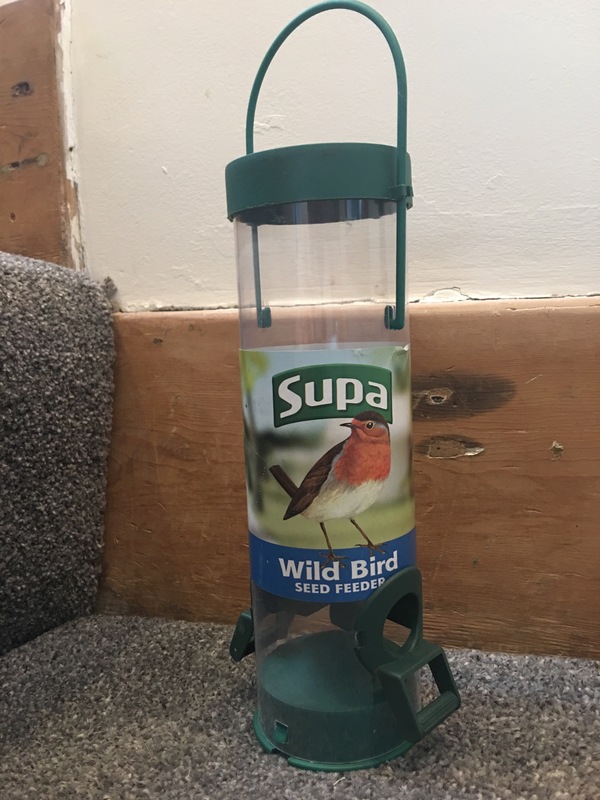 Supa Wild Bird seed feeder (tall size). Manufactured in the UK. Photograph by author. 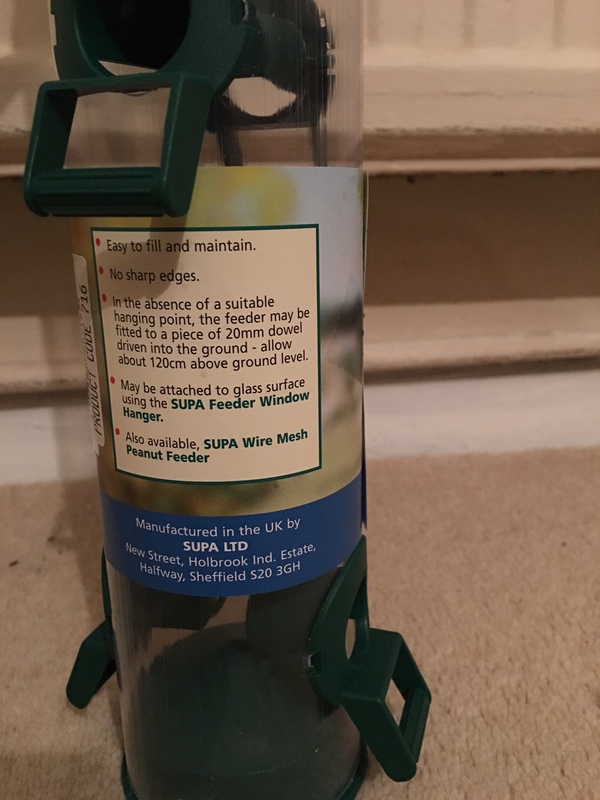 Supa Wild Bird seed feeder (tall size). Manufactured in the UK. Label view detail. Photograph by author. 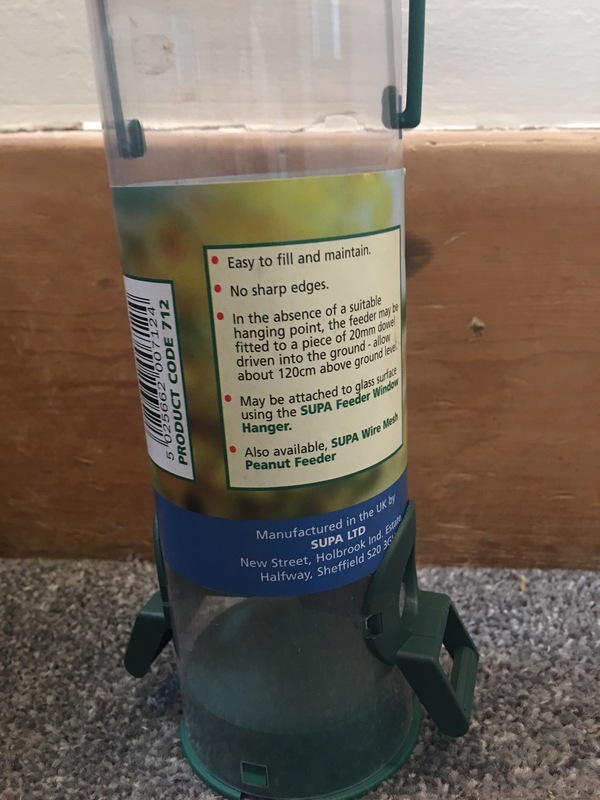 Supa Wild Bird Seed Feeder product code 712 Manufactured in the UK by Supa Ltd Sheffield. Photograph by author 6 June 2018. Standard size. Approx (H) 8″ (20cm) tall. 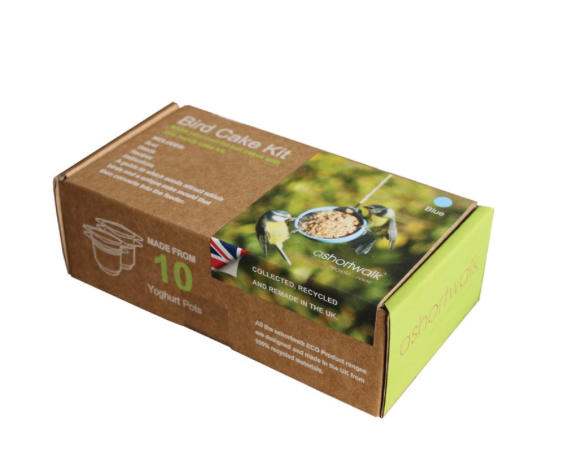 Supa Wild Bird Seed Feeder product code 712 Manufactured in the UK by Supa Ltd Sheffield. Standard size. Photograph by author 6 June 2018. Label view. A British made bird feeder. Suet To Go Birdy Butter Feeder. Manufactured in the UK for Unipet International. View 1. Photograph by author 13 August 2018. 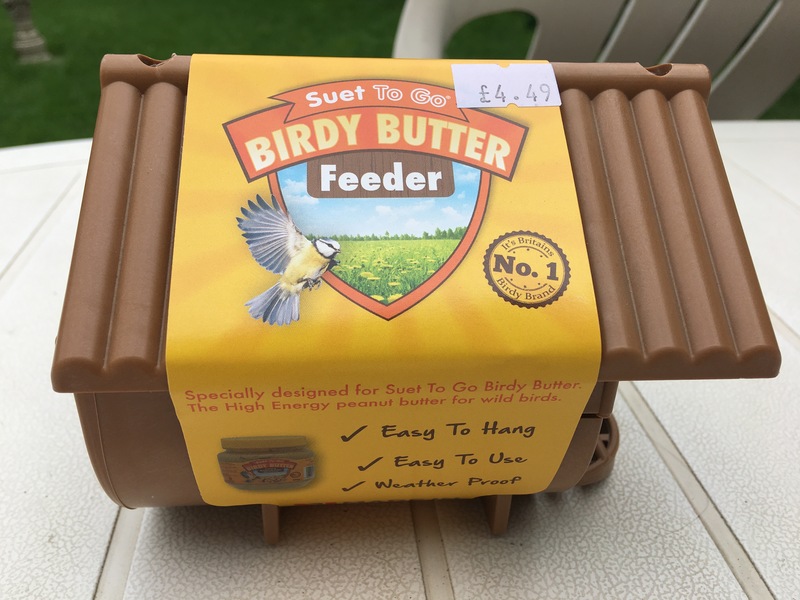 Suet To Go Birdy Butter Feeder. Manufactured in the UK for Unipet International. View 2. Photograph by author 13 August 2018. 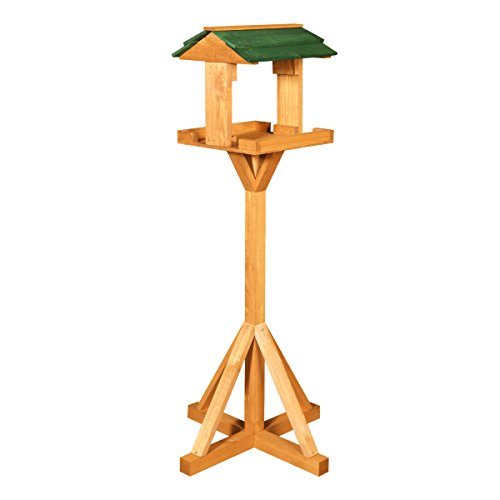 Harrogate Bird Tables Belton Bird Table. Hand crafted in the UK. 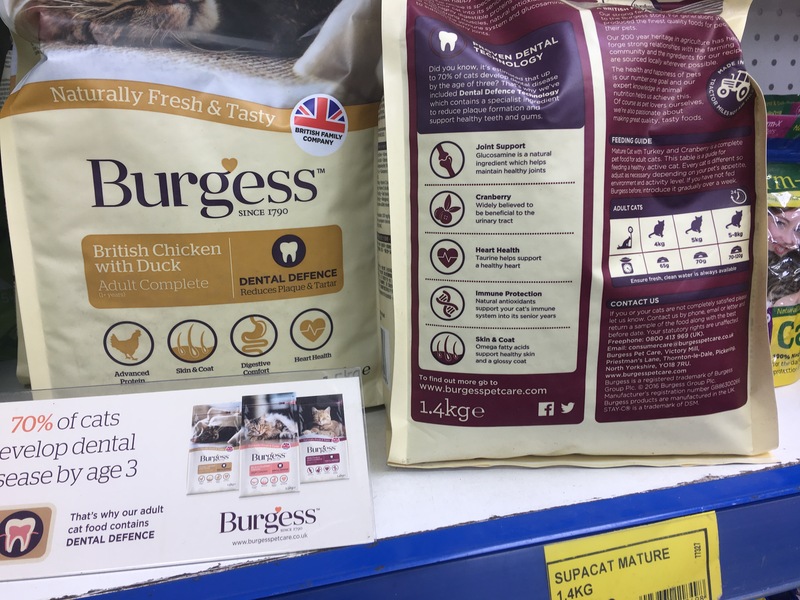 Burgess British Chicken with Duck adult complete cat biscuits (dry food). On display in Flitvale Garden Centre, Flitwick. Burgess products are manufactured in the UK. Photograph by author 26 March 2017. 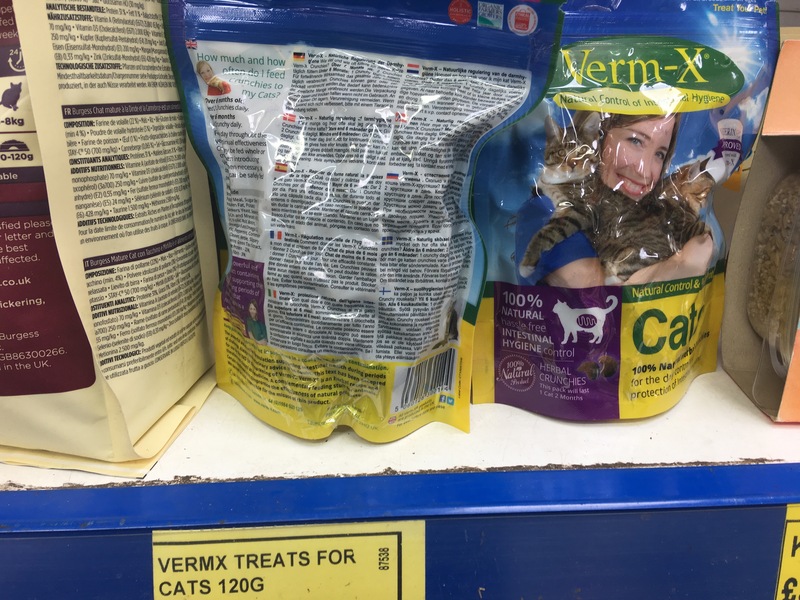 Verm-X cat treats on display in Flitvale Garden Centre, Flitwick. “All Verm-X products are produced in the UK”. Photograph by author 26 March 2017. Pooch & Mutt dog treats are made in the UK. Photograph by author. 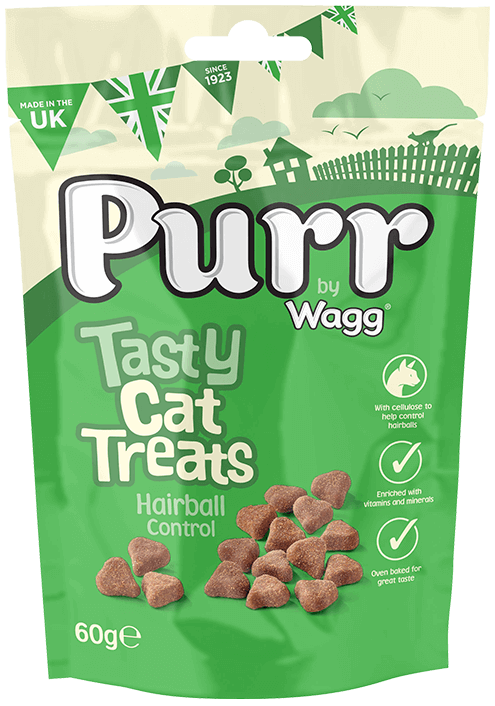 Wagg Purr Cat Treats Hairball Control. Made in the UK. 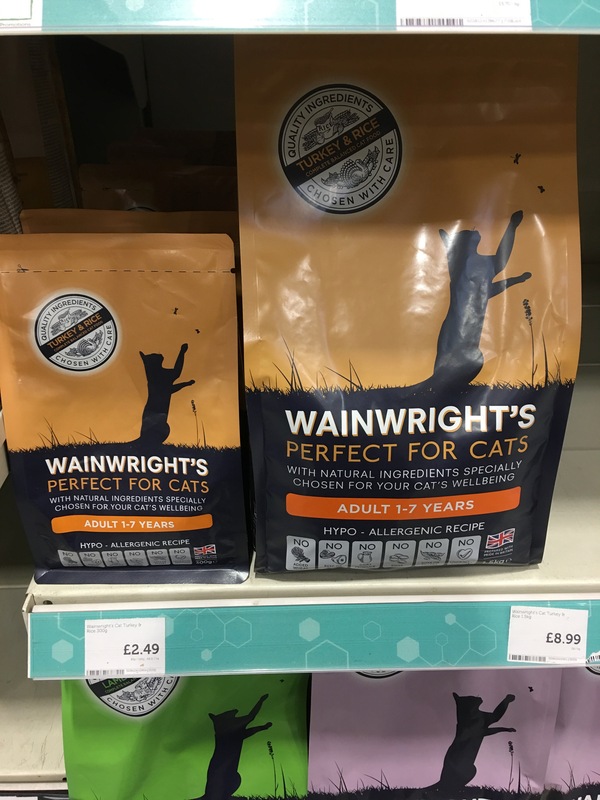 Wainwright’s cat food “Prepared with Pride in Britain”. On display at Pets at Home in Milton Keynes. Photograph by author 17 March 2018. 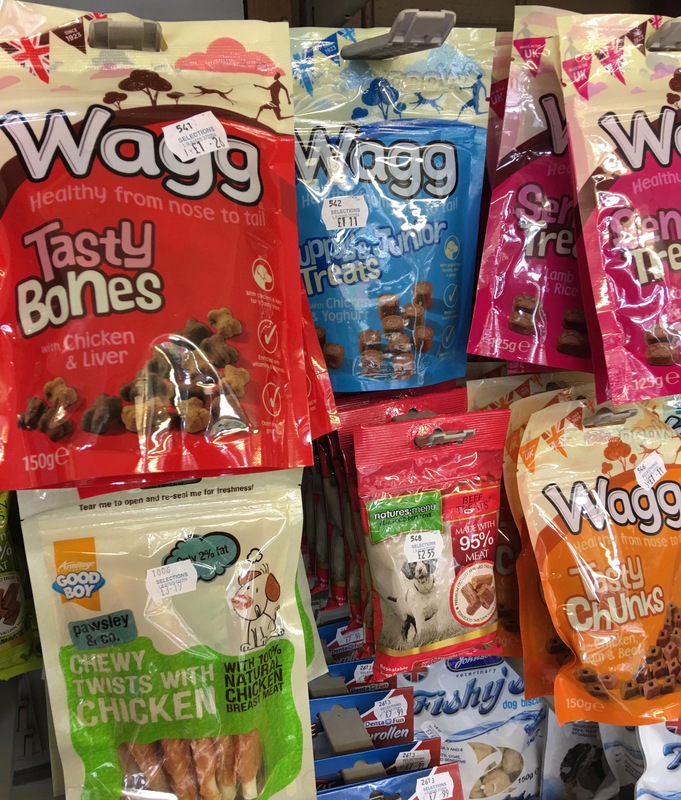 Wagg treats, Natures Menu treats, Johnson’s Vetinery dog biscuits and Good Boy Treats on display in Selections Pet and Garden Store in Leighton Buzzard. Photograph by author 29 March 2017. 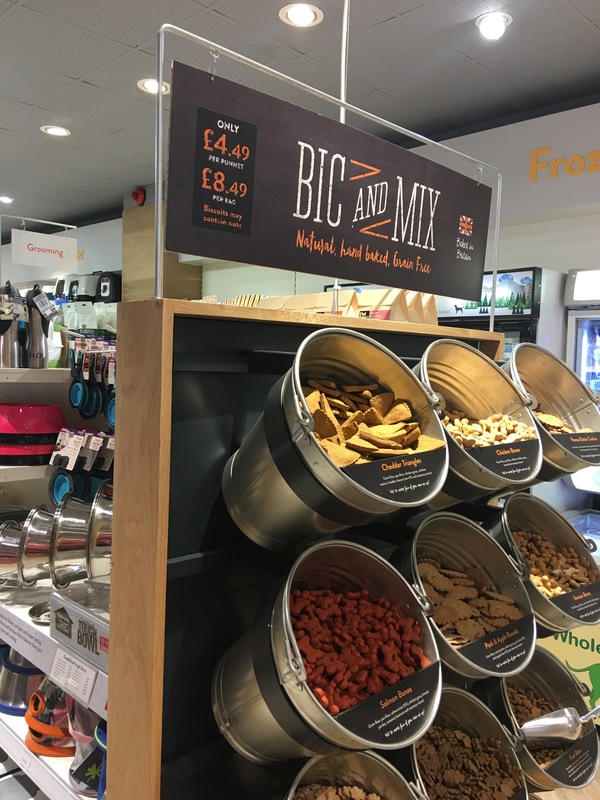 Bic N Mix Baked in Britain dog biscuits on display in Pets Corner Staines. Photographed by author 8 May 2018. 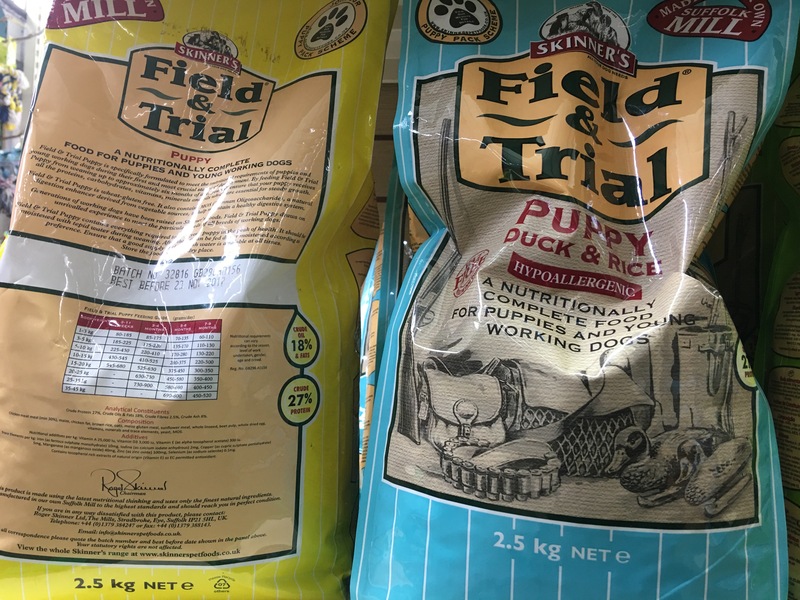 Skinner’s Field & Trial Puppy 2.5kg dry dog food, on display in Flitvale Garden Cenre, Flitwick. Made in England. Photograph by author 26 March 2017. 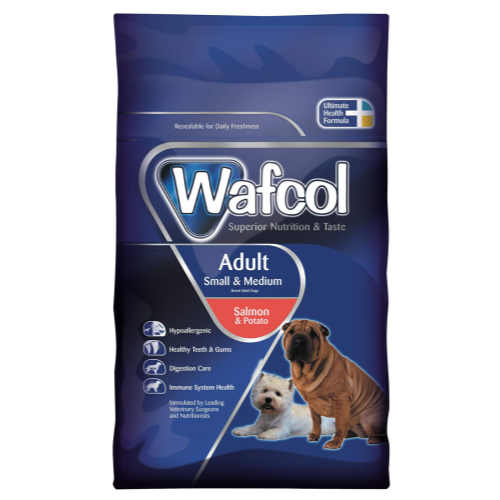 Wafcol Salmon & Potato Small & Medium Dog Food. Made in the UK. Available for example at WaitrosePet. Mars make many of their pet food and pet care products in the UK, but I am not sure which ones. Crown Pet Foods, part of Mars and the makers of Royal Canin and James Wellbeloved, have a factory in Castle Cary in Somerset for example. Pedigree are also owned by Mars. Other Mars brands include Whiskas, KiteKat, Cesar, Sheba, and Catsan. Mars pet care is based in Belguim. 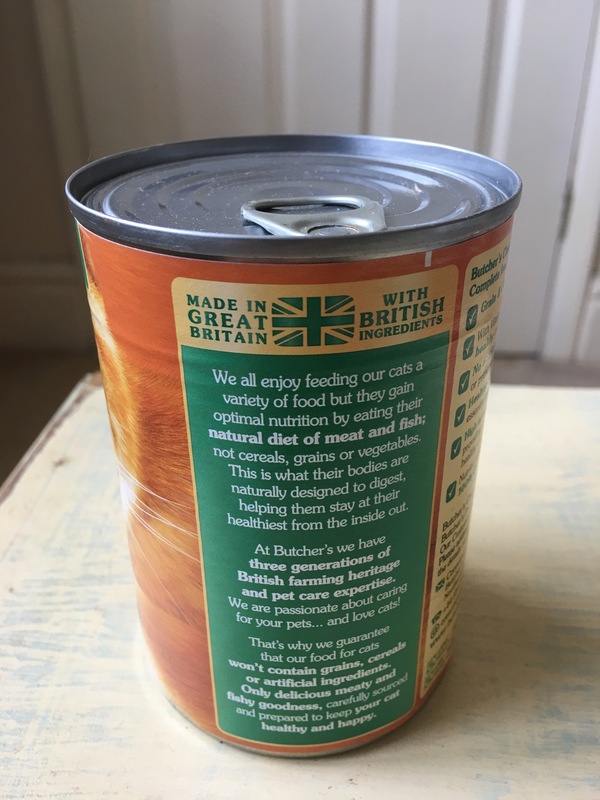 Unhelpfully Royal Canin cat food for example just says “made in the EU” on the packets, which is pointless and meaningless given how big the EU is. All James Wellbeloved dog, cat, and ferret foods are made in the UK. Does anyone know which other Mars pet food / pet care products specifically are made in the UK? Union flag symbol used on the James Wellbeloved website. 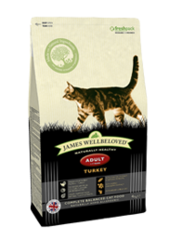 James Wellbeloved Turkey Adult dry cat food. Made in Britain. 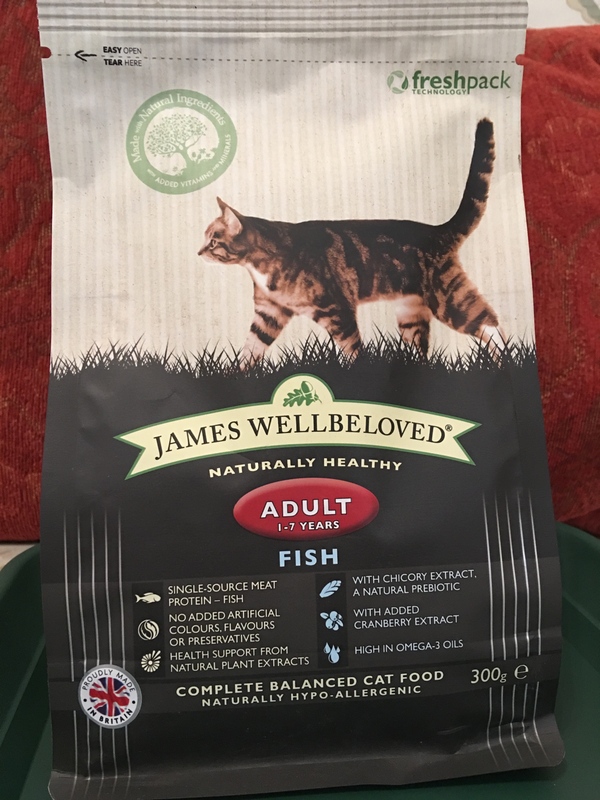 James Wellbeloved Adult Fish cat food. Made in Britain. Photograph by author at Flitvale Garden Centre, Flitwick. Iams is a pet food brand owned by Proctor and Gamble. In north America the brand belongs Mars since Prooctor and Gamble sold Iams, Eukanuba and Natura in north America to Mars in 2014. Iams and Eukanuba do not bother to give any country of origin information on their website and I assume they are foreign made. Why not ask Mars, Proctor and Gamble, and Nestle about exactly where specific products are made. It might encourage them to label clearly. Hills petted is an American company, owned by Colgate Palmolive. They are the makers of Science Plan. They give no information on their website about where their petfoods are made, so I assume they are all foreign made. 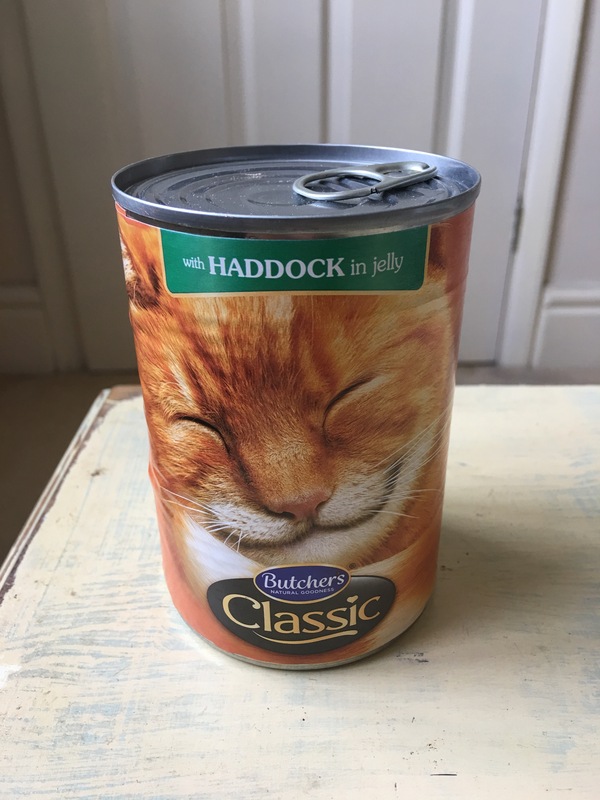 Butchers Classic tinned cat food with haddock in jelly. Made in Great Britain. Photograph by author 25 March 2018. Butchers Classic tinned cat food with haddock in jelly. Made in Great Britain. Photograph by author 25 March 2018. Rear label view. 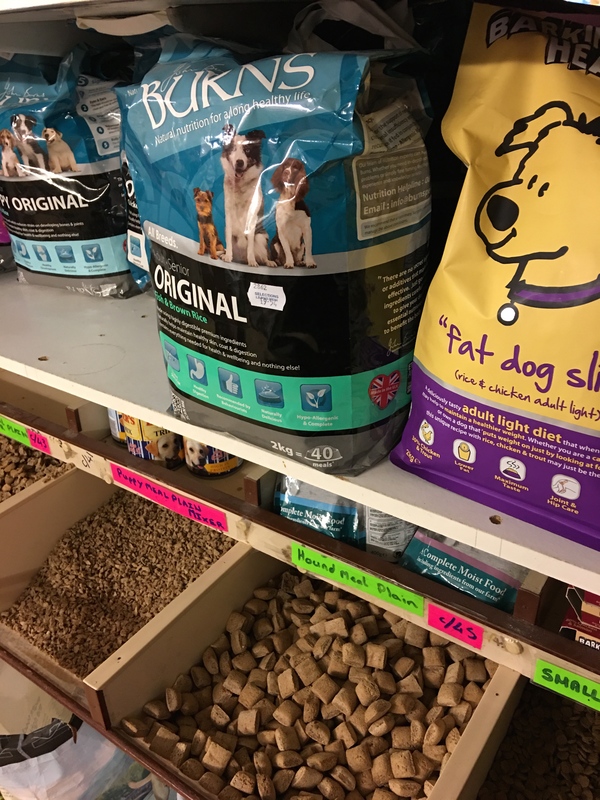 http://www.dogsloveit.co.uk (Goodwyns – dog dry food; made in England). 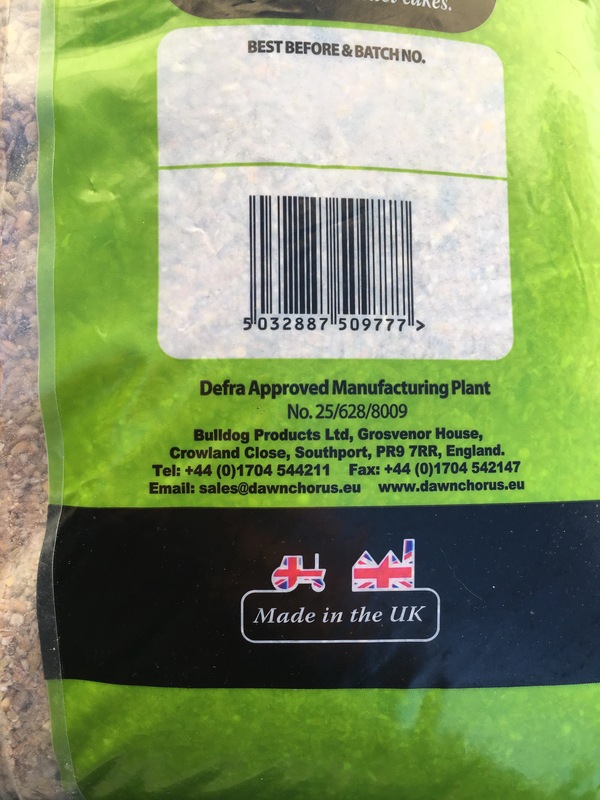 http://www.daviespetfood.co.uk (Davies – Dog dry food, moist chubs, and treats; made in England). http://www.oceanicpetfood.com (Oceanic – Fish dry food and treats for dogs; made in England). Elsa’s Kitty Chicken And Rabbit 10kg adult solid cat food by Nelsons Pet Food. Made in Britain. 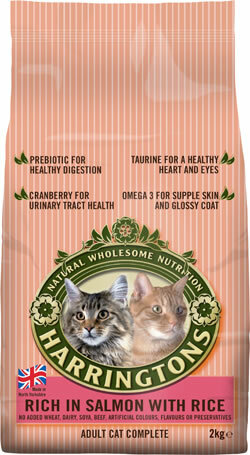 Harringtons Adult Cat Complete Rich in Salmon with Rice dry pet food for all cats. Made in England. 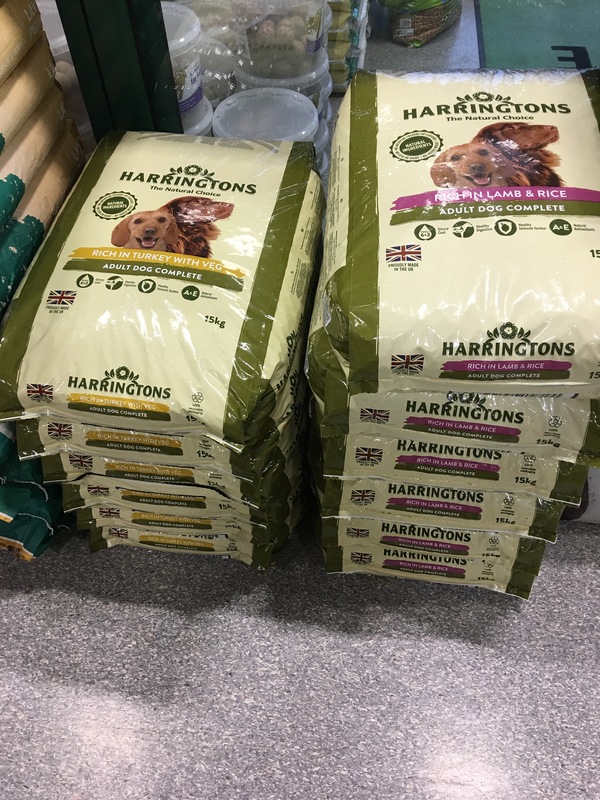 Harringtons Adult Dog Complete pet food on display in Pets at Home in Milton Keynes. “Proudly Made in the UK”. Photograph by author 17 March 2018. Benevo produce UK-manufactured vegetarian and vegan cat food and dog food. Benevo cat original vegan cat food packaging. Made in the UK. 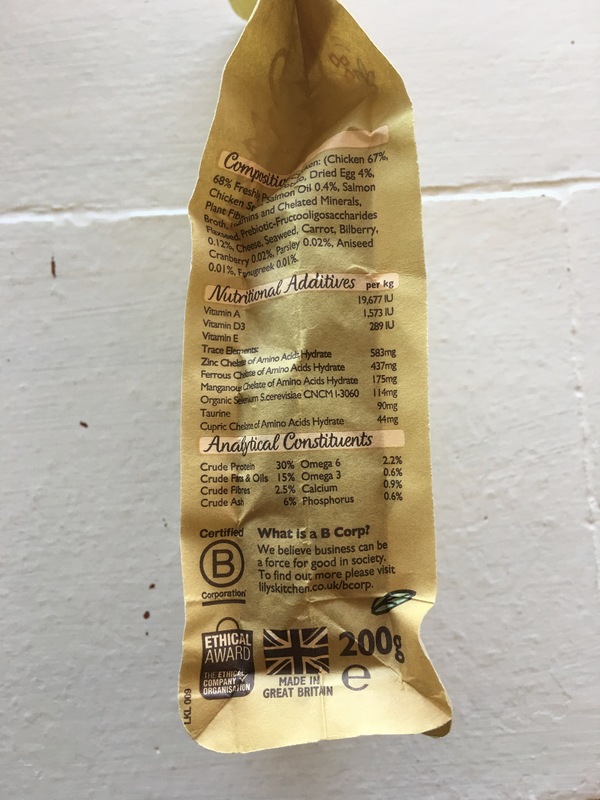 Lovejoys dog food is made in Great Britain. 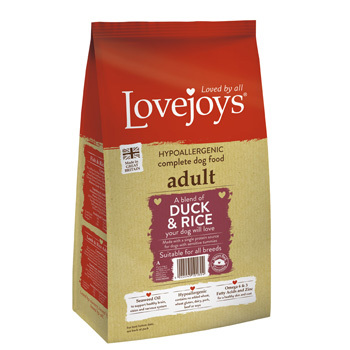 Lovejoys Dry Food Adult: Duck & Rice. Made in Great Britain. 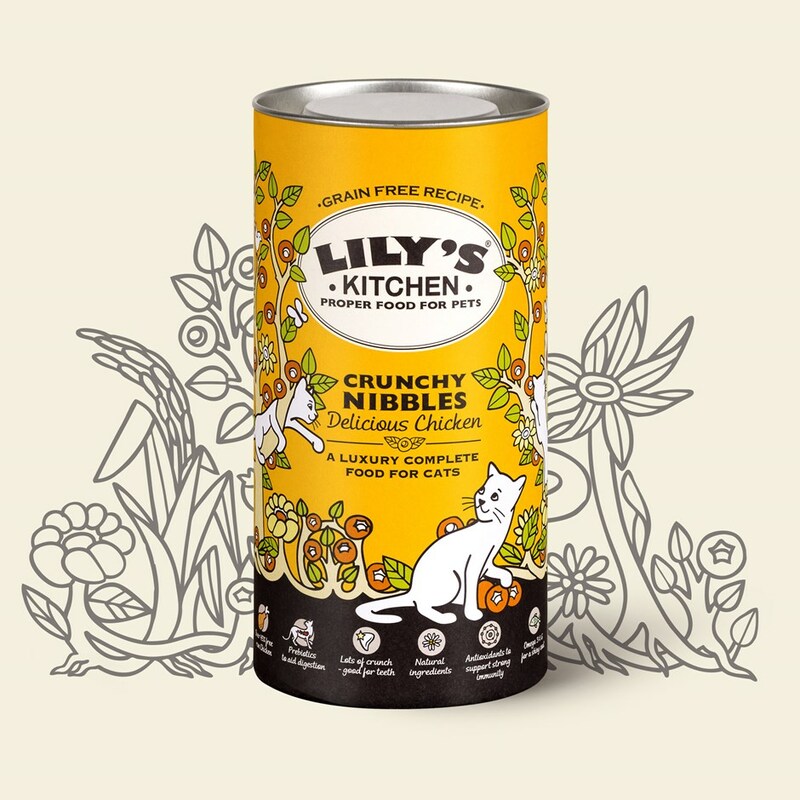 Lily’s Kitchen Crunchy Nibbles – Delicious Chicken dry cat food. Made in the UK. 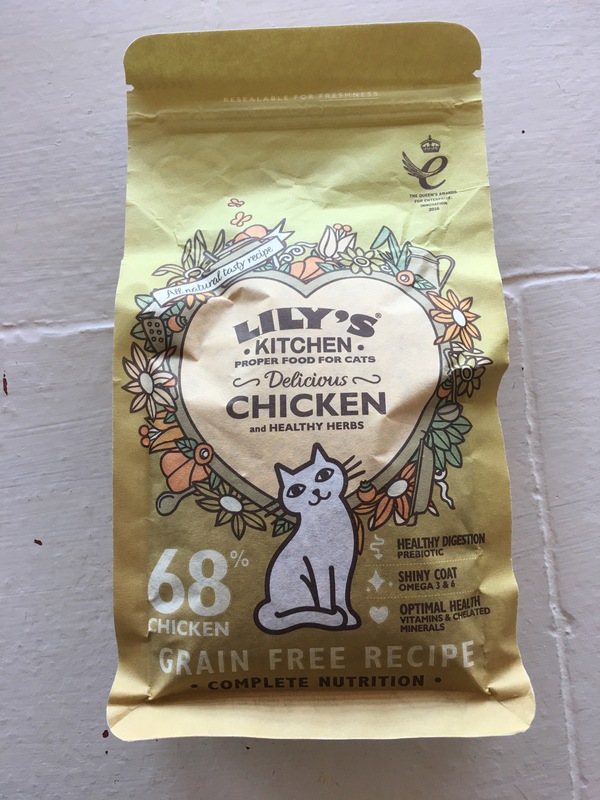 Note all Lilly’s kitchen dog and cat wet food is foreign made and only some Lily’s Kitchen dog and cat dry food is UK made. Lily’s Kitchen chicken cat biscuits. Made in Great Britain. Photograph by author 24 November 2017. Lily’s Kitchen chicken cat biscuits. Made in Great Britain. Photograph by author 24 November 2017. Side of packaging label detail. 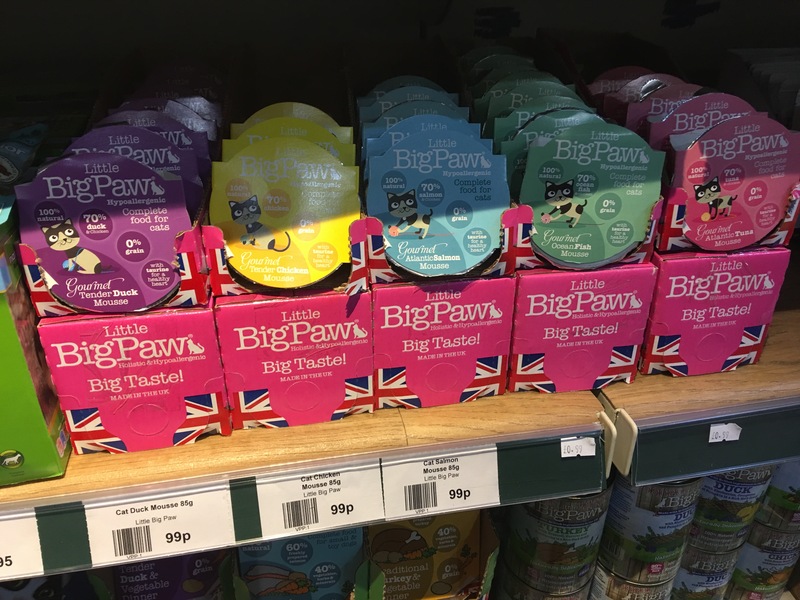 Made in the UK Little BigPaw cat food on sale in the pet store at Longacres Garden Centre, Charlton, near Shepperton. Photographed by author 13 August 2018. 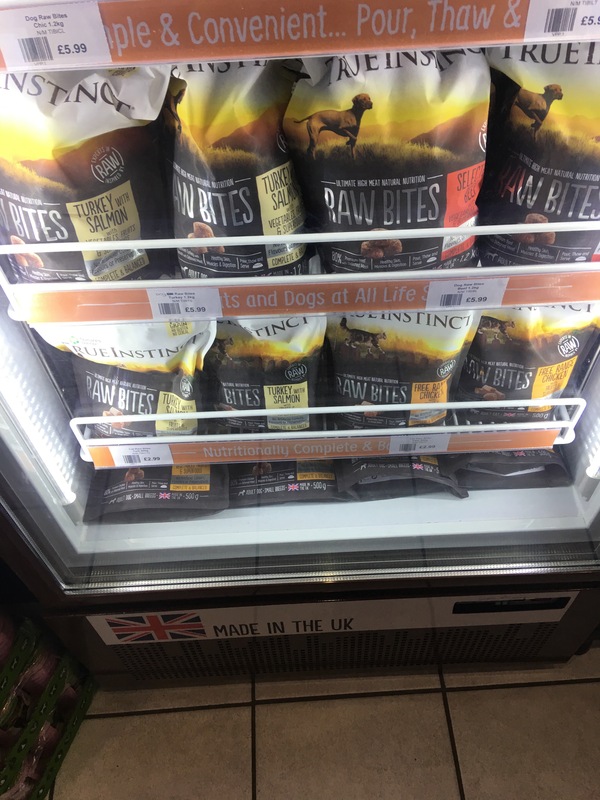 Natures Manu True Instinct Raw Bites cat and dog food. Made in the UK. On display at Longacres Garden Centre, Charlton, near Shepperton. Photograph by author 13 August 2018. Symply Pet Foods Ltd make Canagan pet foods and Symply pet foods. 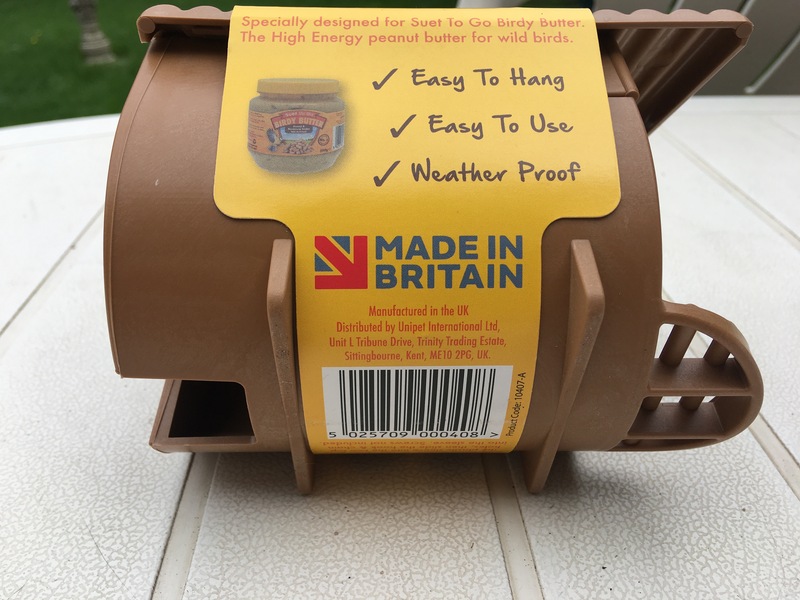 From what I can gather, Symply wet, dry and treats dog food and dry cat food is all British made, although they do not state this very clearly on their website. Country of origin information is given at the bottom of the page against individual products on the Symply website and everything I have found today (26/4/15) on their site was made in Great Britain. 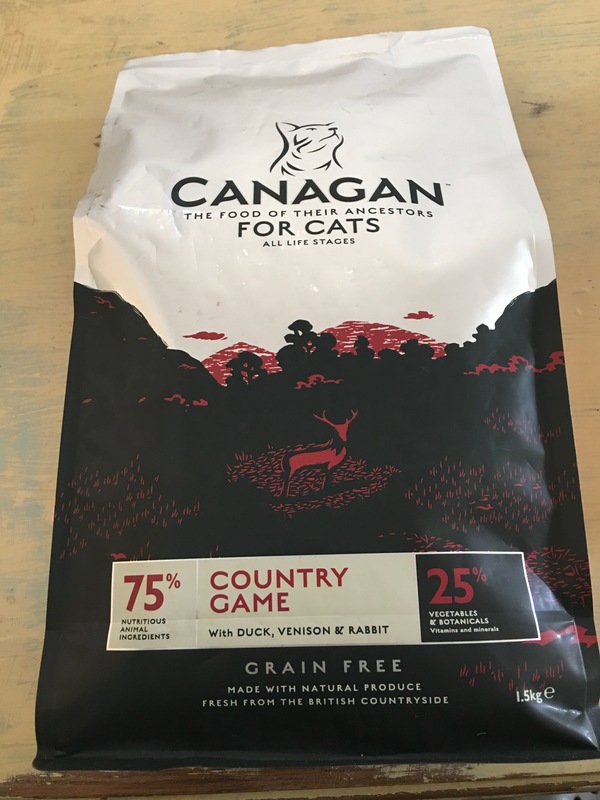 Canagan for Cats Country Game grain free dry food. Proudly Made in Great Britain. Front of packet view. Photograph by author. 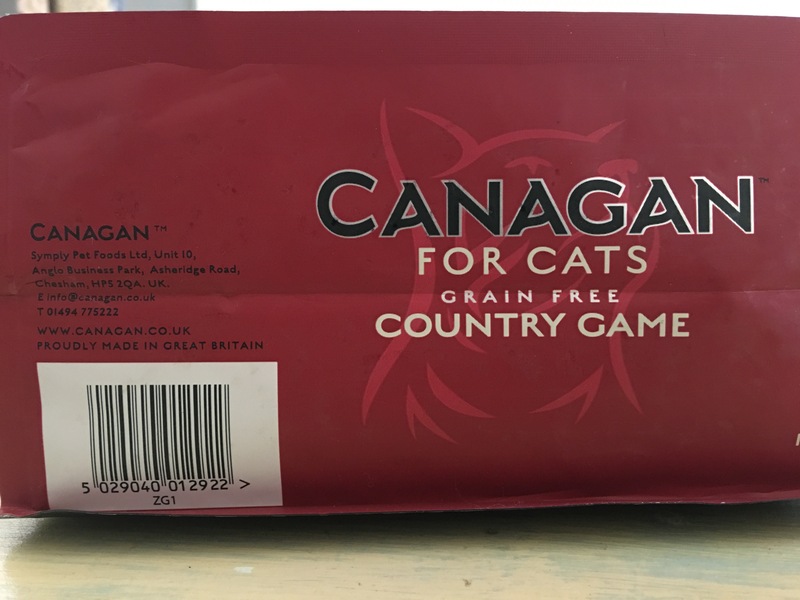 Canagan for Cats Country Game grain free dry food. Proudly Made in Great Britain. Bottom of packet label view. Photograph by author. Burns Senior Original fish and brown rice dog food. Made in the UK Photograph by author, in Selections Pet and Garden Store, Leighton Buzzard. 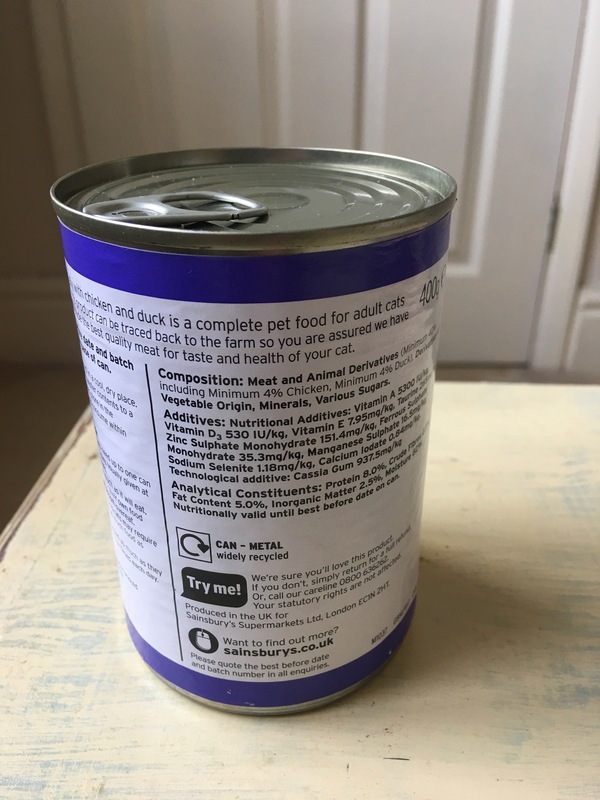 Greenwoods pet food for dogs, cats and small animals appears to be made in the UK. Strangely in this day and age, I can’t find a website for them. I have seen their products online, for example at Zooplus and elsewhere. 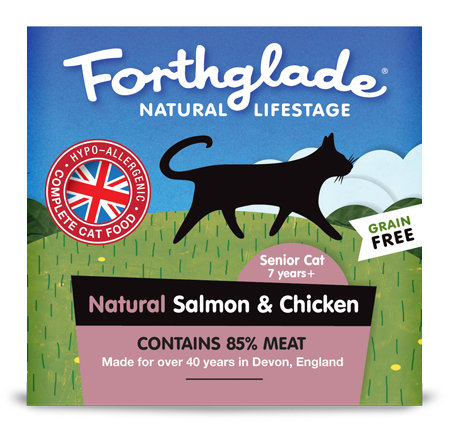 Forthglade Natural Lifestage Salmon and Chicken wet cat food. Made in England. 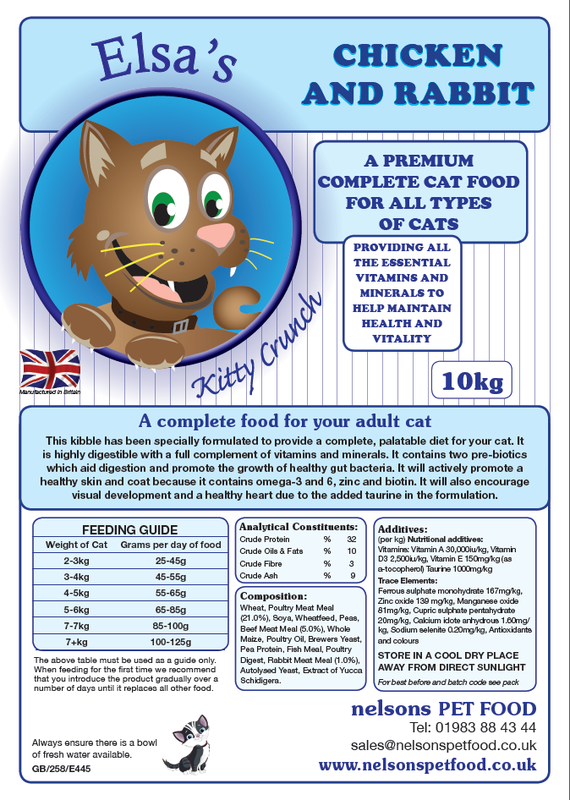 Does anyone know of other pet food made in the UK? Hainsworth – http://hainsworth.co.uk/ – make Newmarket Horse Blankets in England. Friday Fox sell horse blankets – http://www.fridayfox.co.uk. Currently these are Witney horse blankets from Quiltex stock (please note the wool used in these is not British wool), but when stocks run out these will be replaced by blankets made by another supplier (Hainsworth?) Friday Fox tell me. Friday Fox also make other products out of this blanket (as well as some using other fabrics), including dog coats. Fitted Witney Horse Blanket by Friday Fox. Made in England. Need a British made “Beware of the Dog” sign? Rowan Stickers – http://www.classicsign.co.uk – make pet information sign stickers. Rowan Stickers Classic Sign’s range of self-adhesive stickers also includes disabled signs, wheelie bin stickers, warning signs, information signs, stickers for kids, number stickers, letter stickers, stickers for business, pet related stickers, fridge stickers, suitcase stickers, Halloween stickers, Christmas stickers, etc. For boots for riding and such like please also see British Made Shoes and Boots. 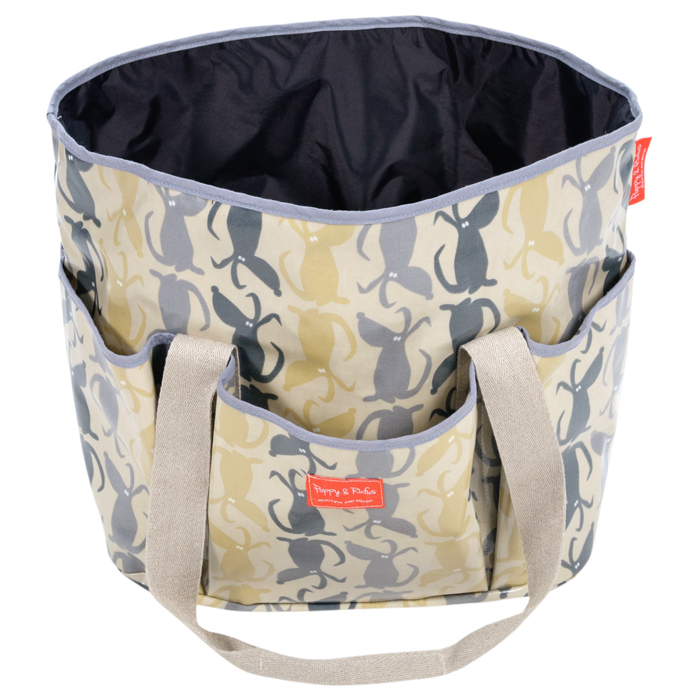 Maisie Storage Basket in Leaf fabric. Made in the UK for Poppy & Rufus. 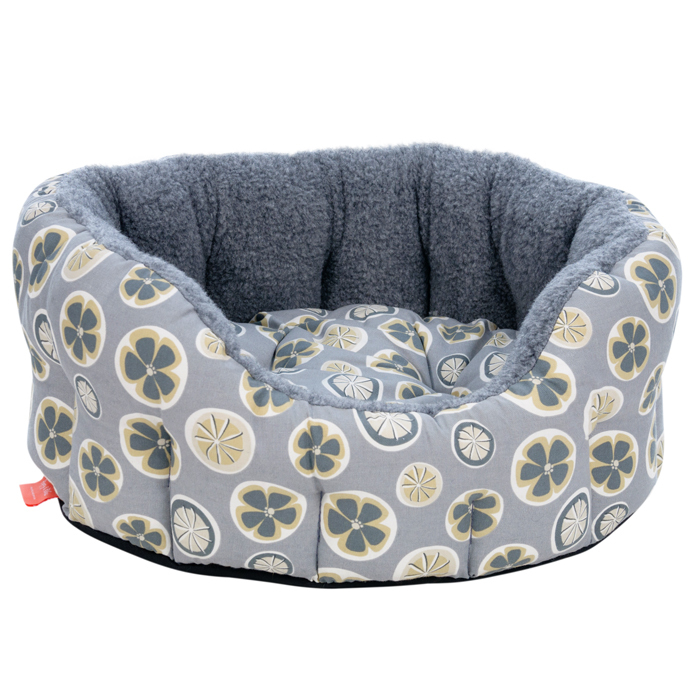 Hector Dog Bed in Poppy fabric. Made in the UK for Poppy & Rufus. 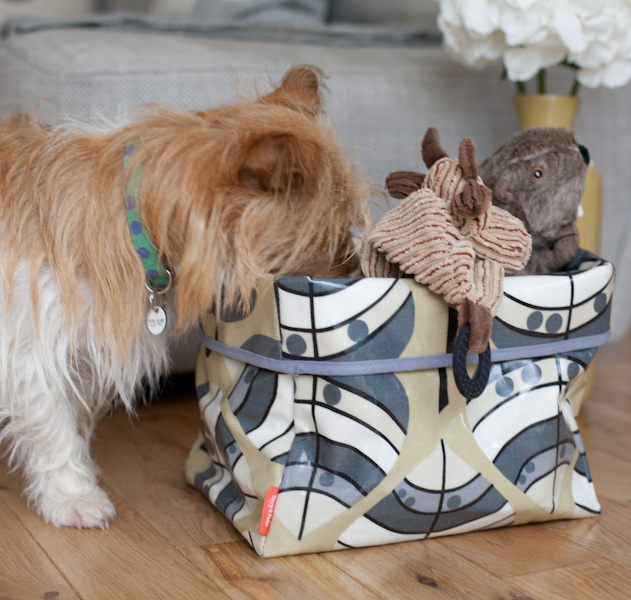 Maxi Dog Travel Bag in Rufus fabric. Made in the UK for Poppy & Rufus. 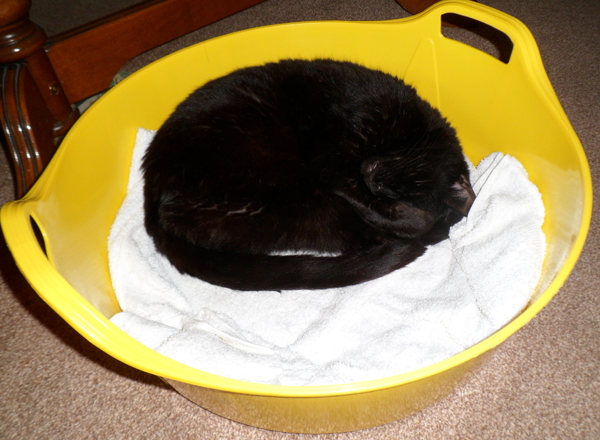 Cat Bed / Basket – 25L – Rainbow Trugs 25L Dish Trug. Made in Britain. PS Pet Tags (Pack Shack Pet Tags) – http://pspettags.com – Made in the UK name tags for dogs and cats. PS Pet Tags are top quality and they provide excellent customer service. 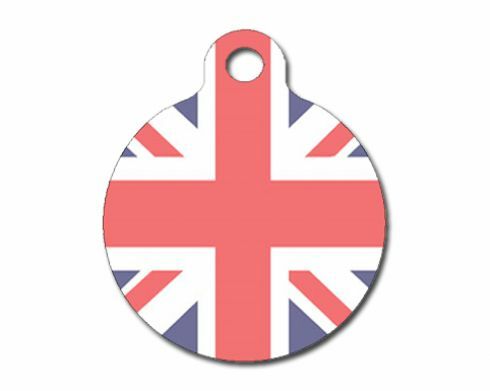 PS Pet Tags Union Jack tag. Made in the UK. Human chocolate contains Theobromine, a naturally occurring compound found in the cocoa bean, and it is this that is poisonous to dogs and cats. Instead feed your pet a suitable ‘safe’ alternative such as Good Boy dog-safe choc drops or Hatchwell Easter Eggs. There are other hidden dangers to dogs, cats and other pets in certain foods, plants, drugs and insecticides for example, plus road accidents. You can find research and find advice on the internet, for example at Bluecross, the RSPCA, the VPIS and many other sites. Some of the most common, potentially severe cat and dog poisons reported to the VPIS, are listed on the RSPA and VPIS websites. This entry was posted in Blankets, Horse Blankets, Pet Products, Rainbow Trugs, Robinson Healthcare, Royal Warrant Holders, Whistles and tagged A Short Walk, AATU, Abbey England, Abbeyhorn, Acme, Acme Whistles, Aerborn Bandages, Albion Saddlemakers, Albion Sporting, Alpha & Ruby’s, Amberslade Pet Food, Anthony and Brown, Arden Grange, Ardingly Arks, Armitage Pet Care, Ashley Craig, Avondale Pet Luxury, Baileys Pet Foods, Bakers Complete, Barker & Barker, Barking Heads, Barkitty, Baxter and Snow, BBD, BEC, Beckons, Benevo, Berkeley Dog Beds, Bertz Pet Bakery, Bestpets, Betty & Butch, Bic N Mix, Big Hug, Big Tomato, Billy + Margot, Bird baths, Bird feeders, Bird seed, Birdhouse Follies, birdtables.org.uk, Bob Martin, Bonio, Breeder Celect Cat Litter, BreederCelect Cat Litter, Brigadier's Choice, British Made Pet Products, British made pet tags, British Pet Products, Burgess, Burns, Butcher’s Pet Care, Cages, Caldex, Cambrian Woollen Mill, Canagan, Carpenter, Carr and Day and Martin, Cat Collar Tags, Cat Litter, Cat litter made in UK, Chapelstone, ChapelWood, Cheshire and Wain, CJ’s, Clippersharp, Copdock Mill, Cosipet, Cotswold Aquarius, Creature Clothes, Crown Pet Foods, D for Dog, Dalton's Leather, Davies, Dawn Chorus, Defender bird spikes, Dimbleby Ceramics, Ditsy Pet, Dober & Dasch, Dog Collar Tags, Dog Tags, Doggie Coats, Dreamy Pet Products, E Jeffries & Sons Limited, e-Bay, EcoKitty, Ede & Roxie, Edge Beanbags, EdwynUK, Emma Bridgewater, Epiony, Equetech, EQUI-SCUTO, Ernest Charles Co., Feelwell’s, Felix, Feloo, Fenella Smith, Fig bags, Fold Hill, Forest Fleece, Forthglade, Friday Fox, Friendly Natural Cat Litter, Friskies, Fyna-Lite, Gap Garden Products, Gardman, GB Tack Shop, GoCat, Good to be Outdoors, Goodwyns, Gourmet, Great & Small, Green and Blue, Green and Wild's, Green Dog, Green Peak Gear, Greenwoods, H. G. Gladwell & Sons, Hainsworth, Harold Moore, Harringtons, Harrogate Bird Tables, Hatchwell, Hatchwell Pet Products, HeartVets, Hettie, HiK9, HiLife, Hiro + Wolf, Holly and Lil, Horse Blankets, Houndworthy, HPP UK Ltd, Hug Rug, Hungry Hector, Ideal Saddle Company, Igloo, J Clark and Company Limited, James Wellbeloved, Jefferies, Joe & Jill’s, Johnson’s Veterinary, Jones and Son, Journeyman Leather, Just Wool Textiles, Kitty-Lou, KJK Rope Leads, KJK Ropeworks, KoogaTree, Lancashire Textiles, Laurence Butler Ltd., Lavenham, Lavenham Jackets, Lawrence Petcare, Lily’s Kitchen, Lintran, Lissom and Muster, Little BigPaw, Louisa Brown, Lovejoys Dog Food, MANN + MOON, Mars, Mars Pet Food, Mars Petcare, Master Ropemakers, Master Ropemakers Chatham, Meowing Heads, Millies Wolfheart, Minkeys Tweed, Moorland Rider, Moquette, Muddy Paws, Mutts and Hounds, Natural Instinct, Nature’s Feast, Natures Menu, Nelsons, Nelsons Pet Food, Nestle, New Equine Wear, Newmarket Horse Blankets, Oceanic, Oggi’s Oven, Omlet, Oscar & Hooch, Oscar Pet Foods, Outhwaites Ltd., Pedigree, Pegasus Health, Pero (Foods) Ltd, Pero Dog Food, Pet Care, Pet Food, Pet Mate, Pet N Home, Pet Products, Pet Products Made in the UK, Pet signs, Pet tags, Pet's Kitchen, PetPlanet, Petrope, Pets Choice, Petsmill, Phunky Pets, Pooch & Mutt, Pooch and Company, Pooch's, Poppy and Rufus, PS Pet Tags, Pup Tart Handmade, Purina, Rainbow Trugs, Reefer, Robinson Animal Healthcare, Rope dog toys, Rope toys, Rowan Stickers, Royal Canin, RSPB, Sainsbury's, Sara Norwood, Sea Treats, Skinner's, Smart Cat Litter, Smartcat Cat Litter, Snug and Cosy, Soap, Spillers Pet Foods, Stubbs, Stubbs England, Supa, Supreme Products, Symply, Tangle Teezers, Taylors, Tesco, The Dartmouth Canvas Factory, The Dog Treat Company, The Hutch Company, The Innocent Hound, The Original Rug Bag Company, The Trap Man, Tom Chambers, Toughmutts, Town & Country Petfoods, Traps, Trophy Pet Foods, True Instinct, UK made pet tags, UK Pet Beds, Unipet International, Unite and Type, Verdo Cat Litter, Verm-X, Vet’s Kitchen, Wafcol, Wafcol dog food, Wagg, Wagg Pet Foods, Wainwright's, Waitrose, WaitrosePet, Webbox, Westland Horticulture, Whiskas, Whitefurze, Wild Olive soaps, WildWash, Winalot, Woof and Brew, Zebedee's Catnip Mice on May 20, 2013 by ukmade.